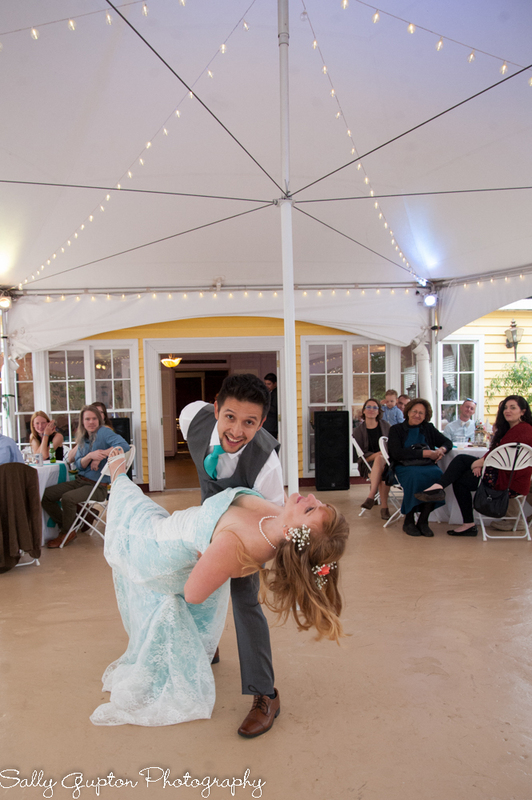 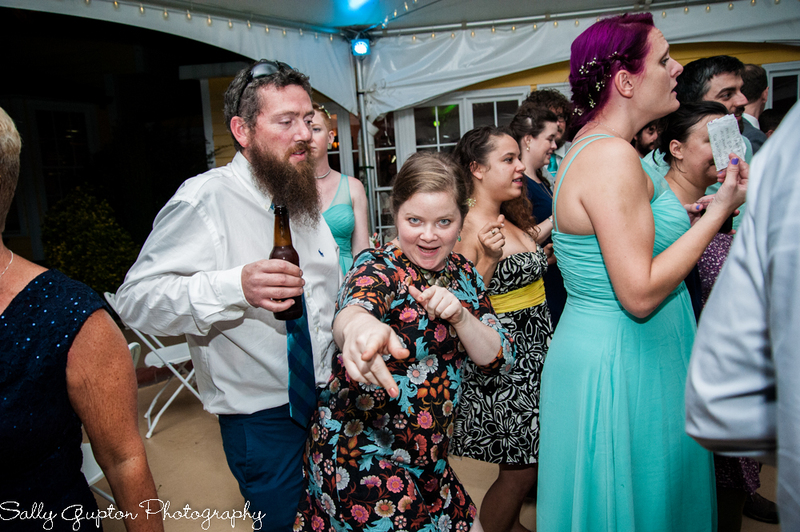 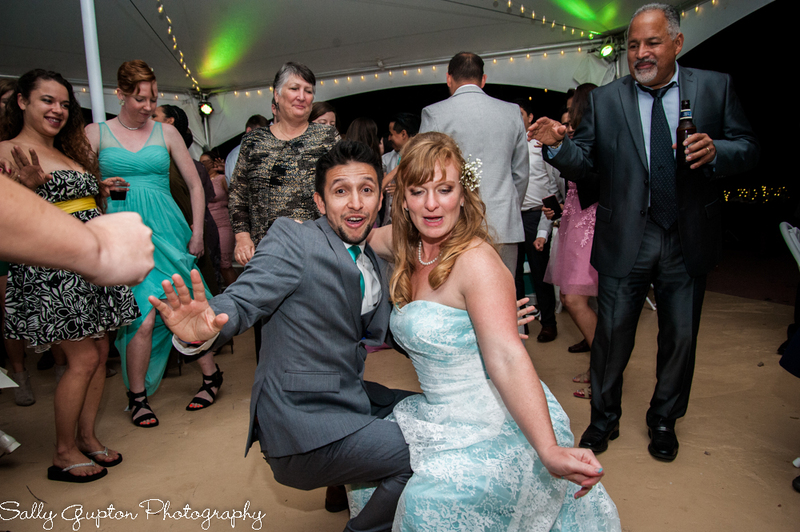 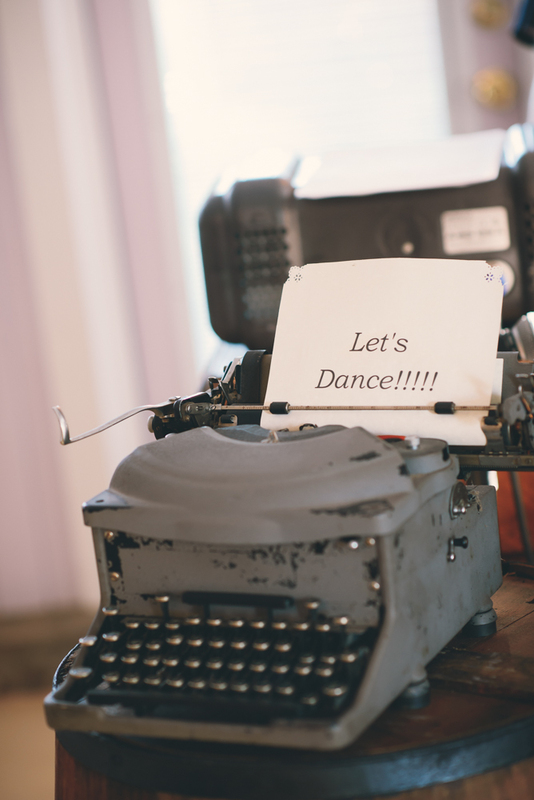 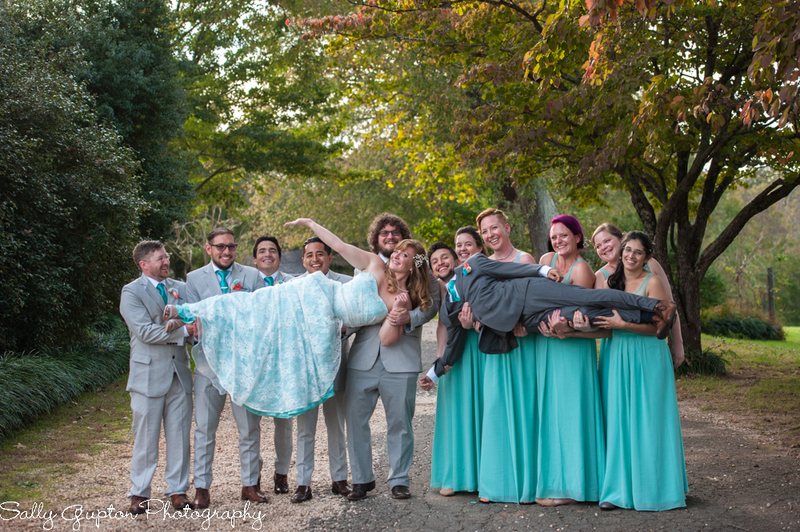 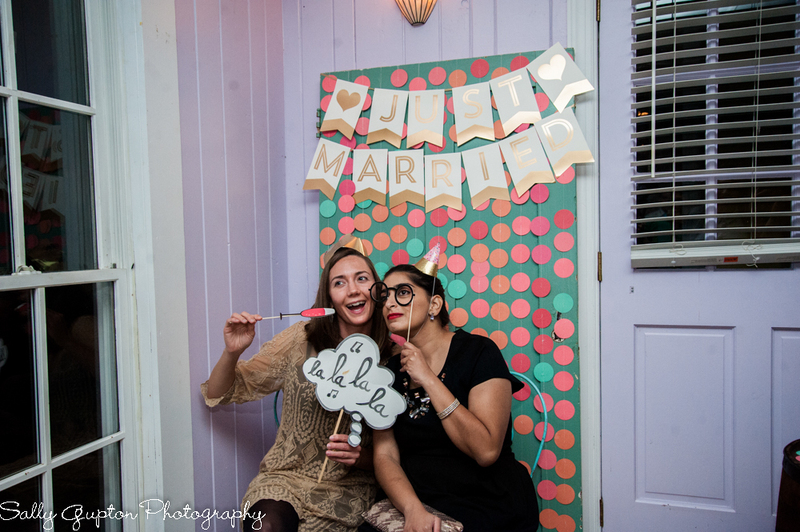 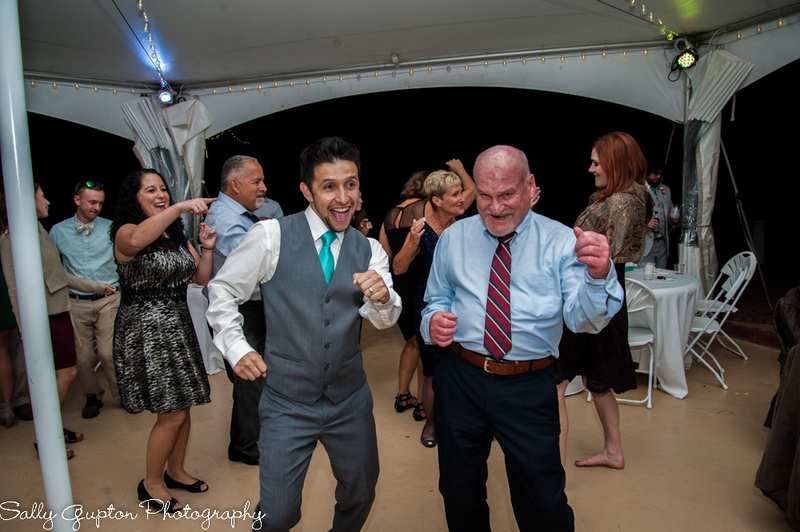 This wedding was so much FUN! 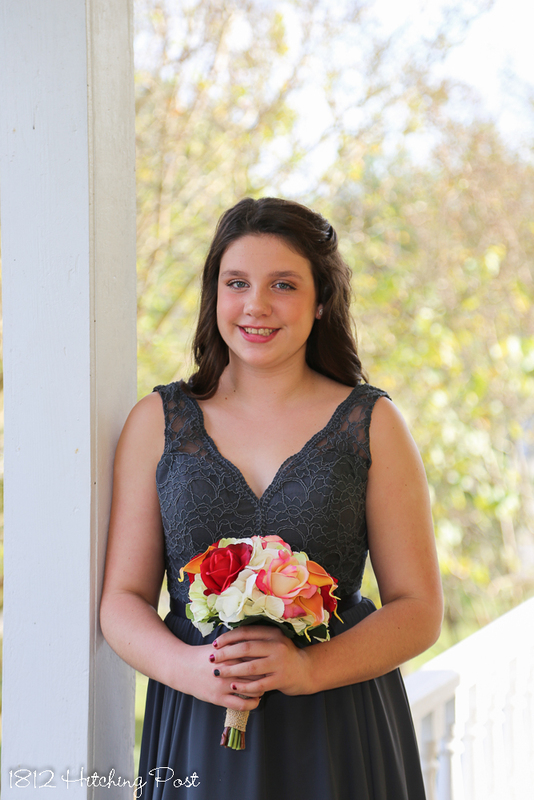 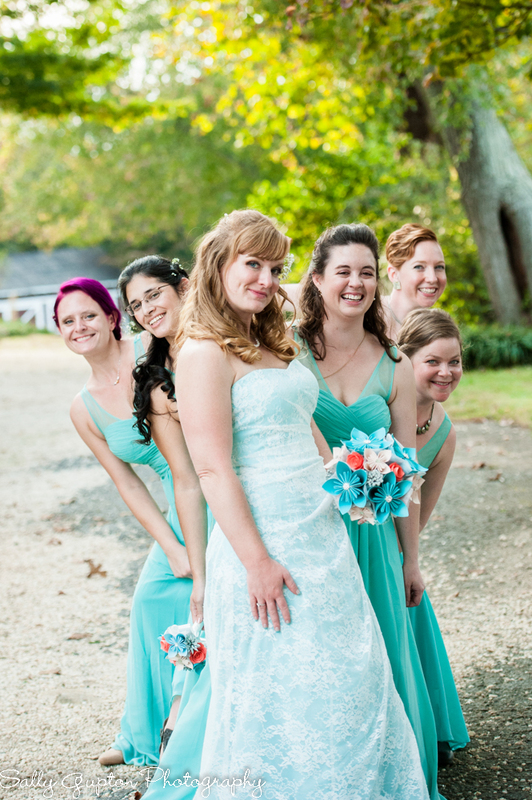 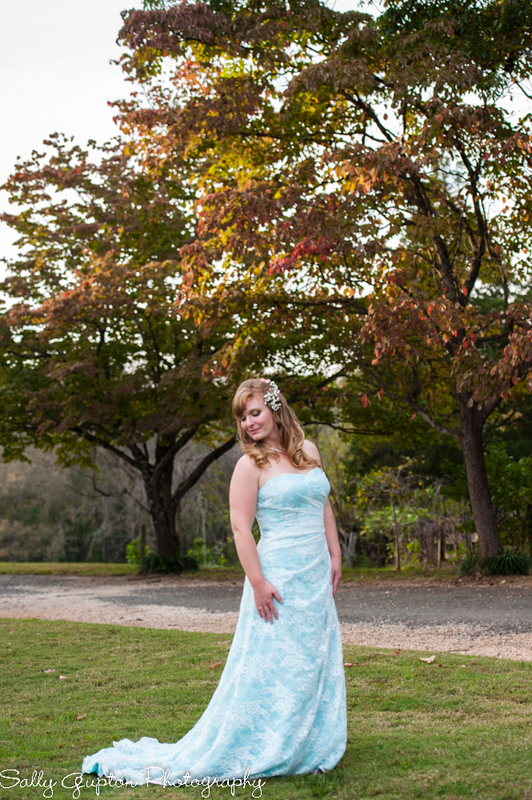 Brenna’s dress matched her personality; lovely with a lot of color! 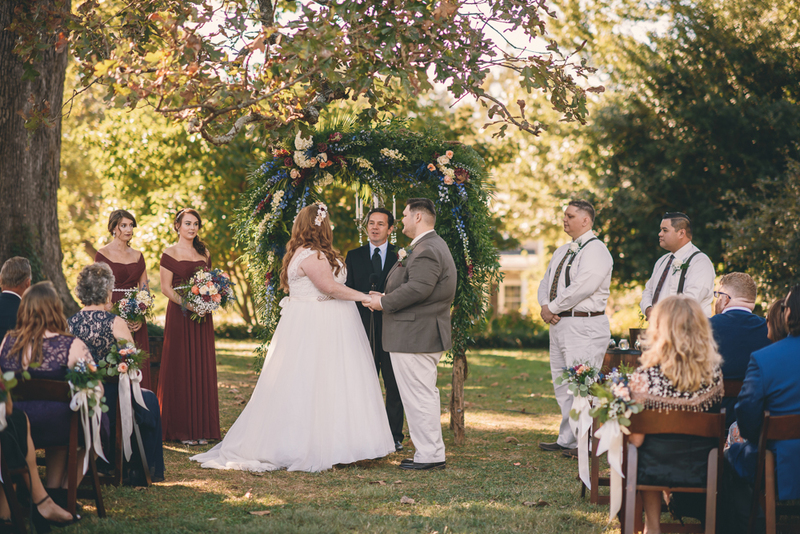 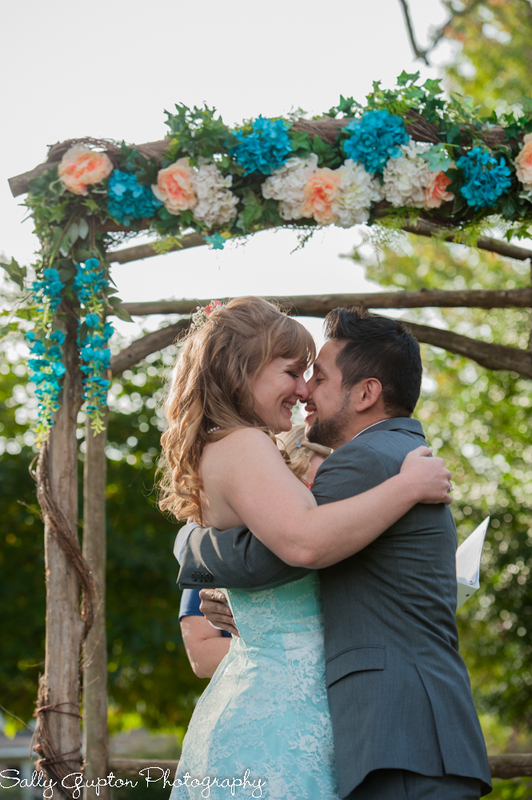 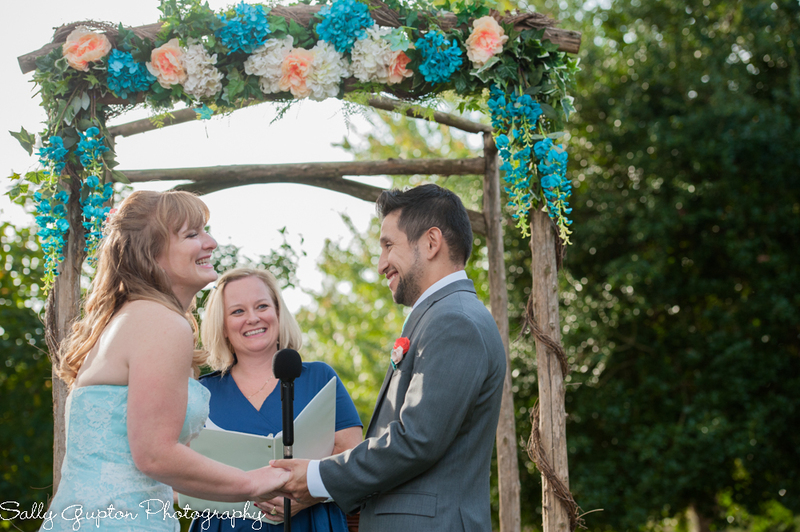 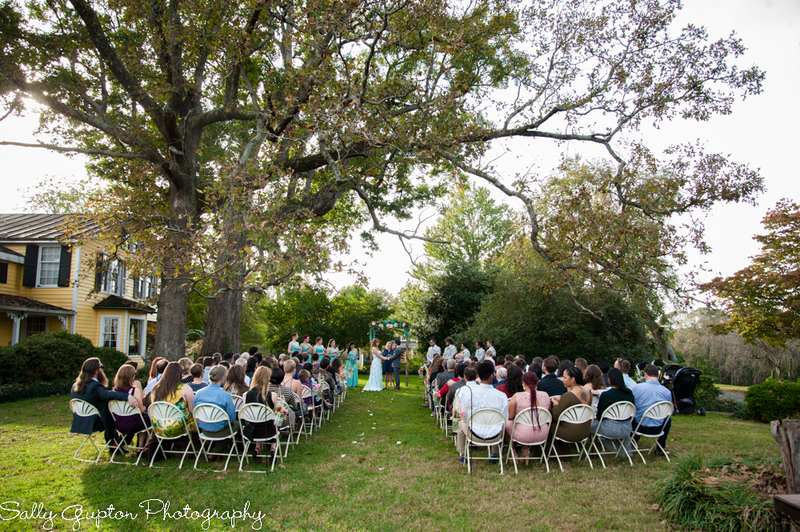 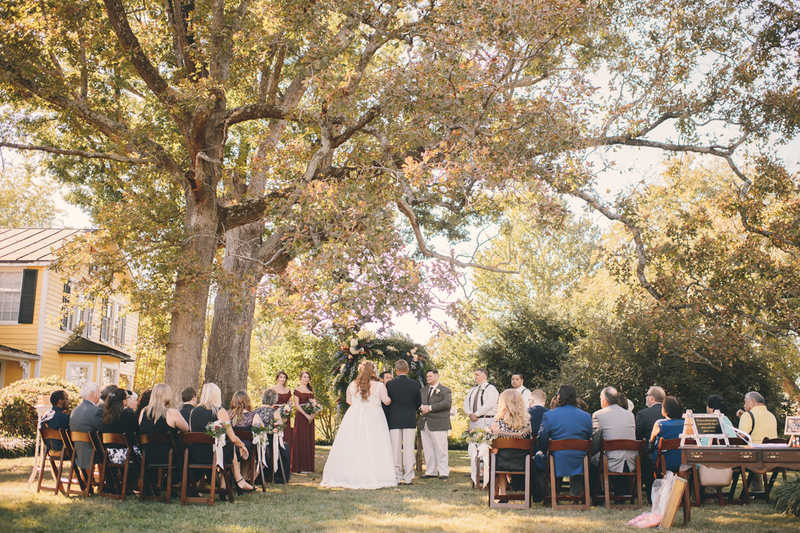 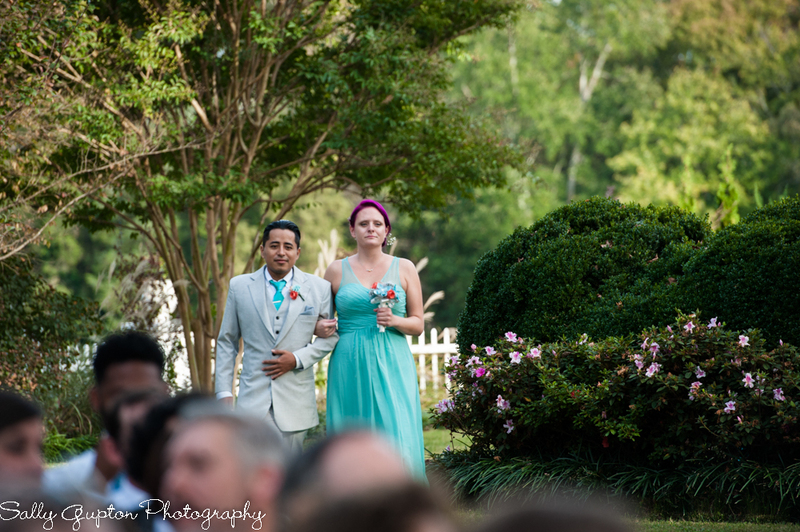 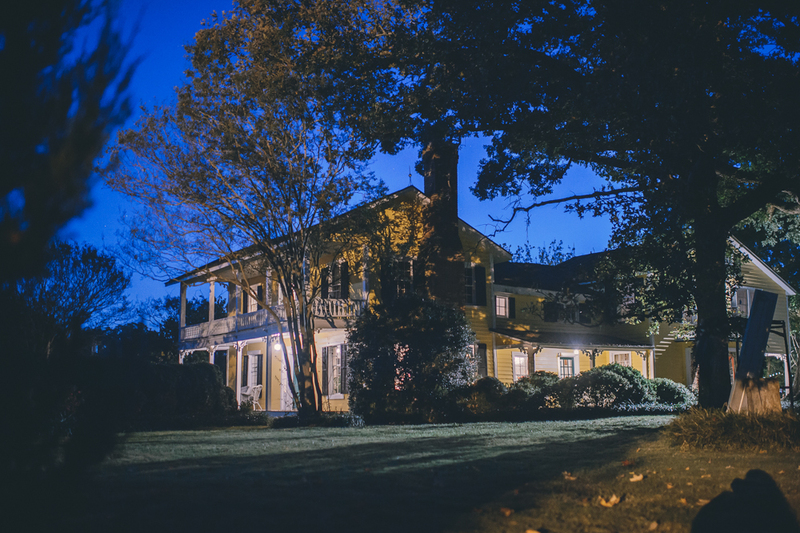 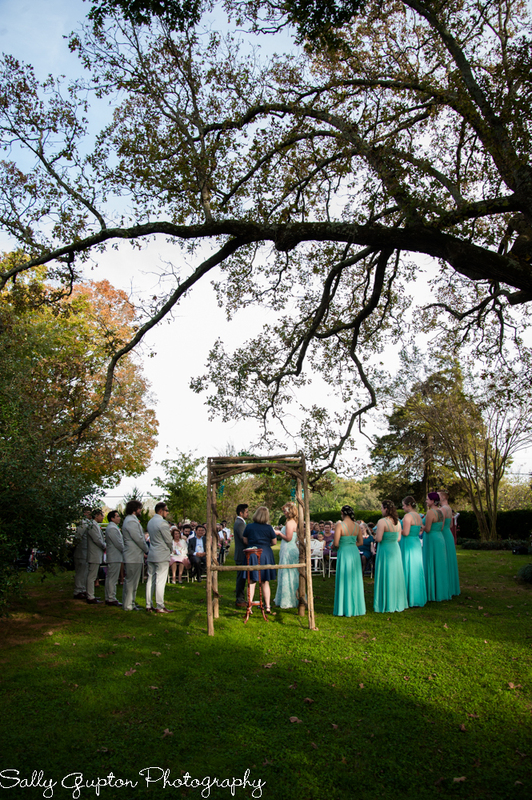 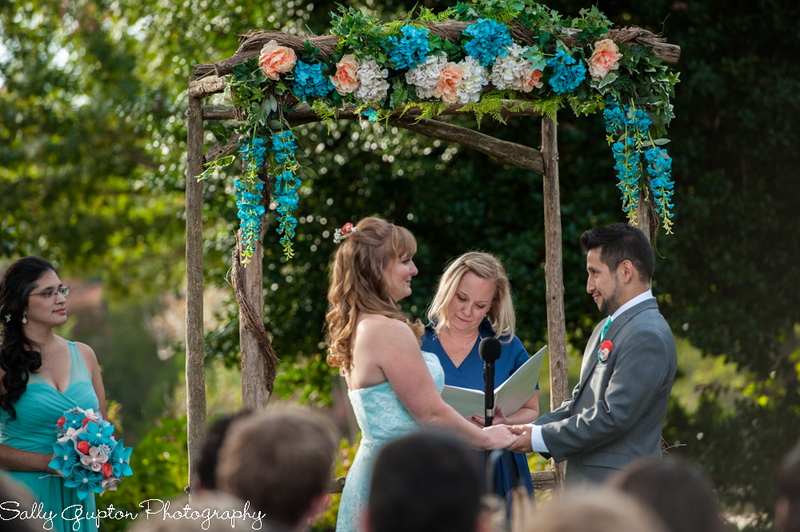 The 4:30 ceremony with 110 people, officiated by Ashley Campbell, was on the side lawn under the giant oaks. 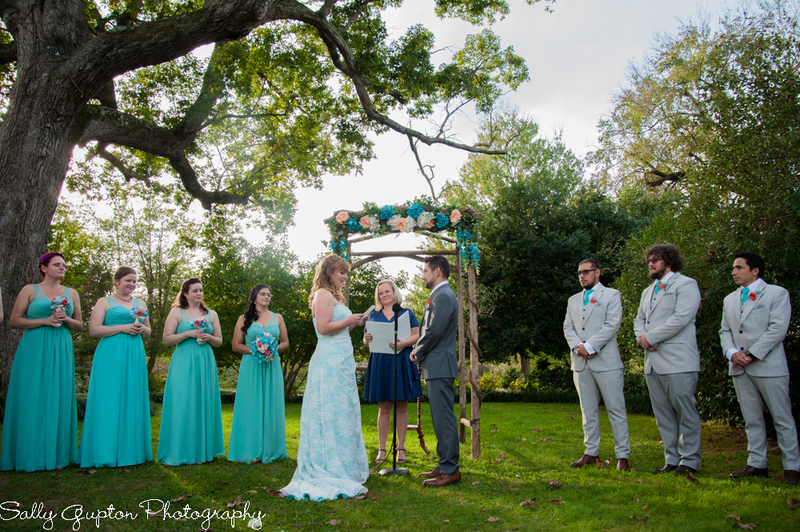 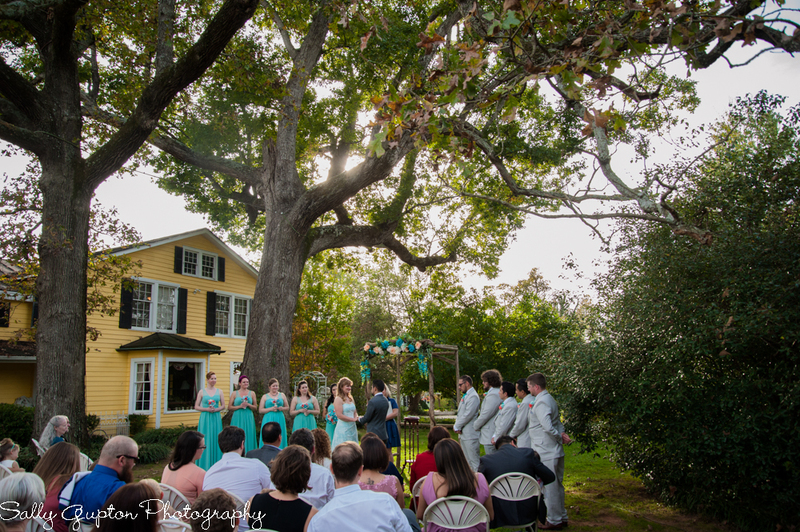 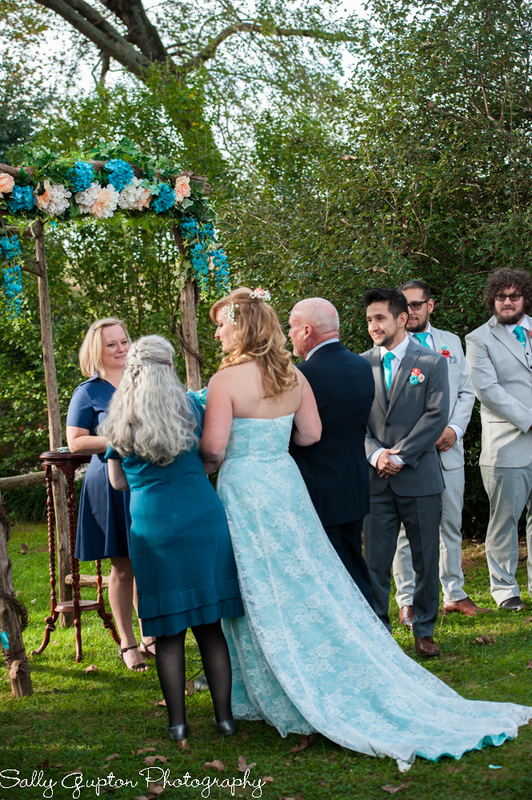 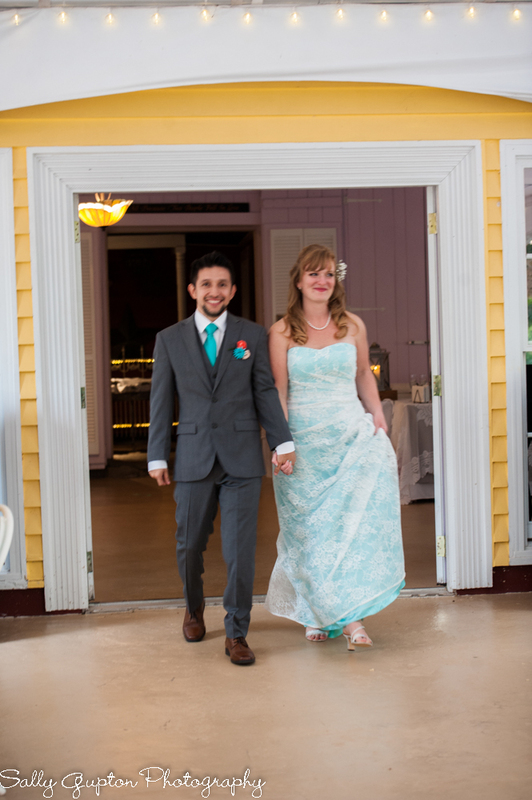 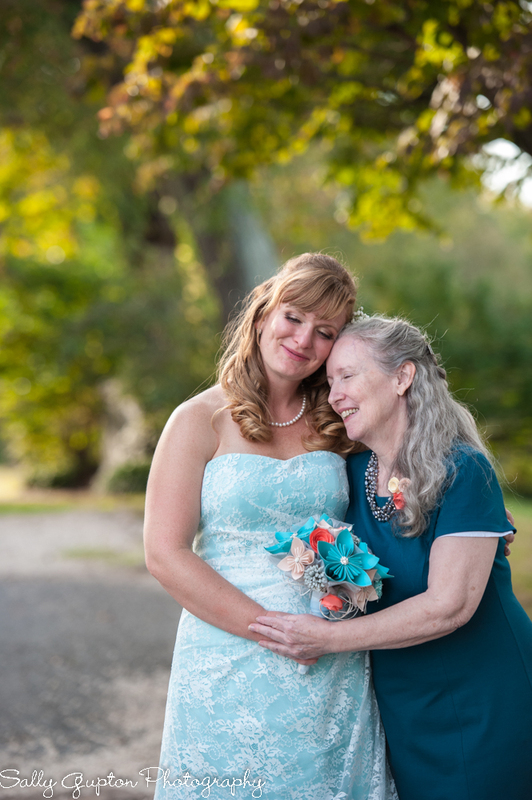 The arbor was decorated in turquoise, peach, and white with peach and white flowers along the aisle in hanging mason jars. 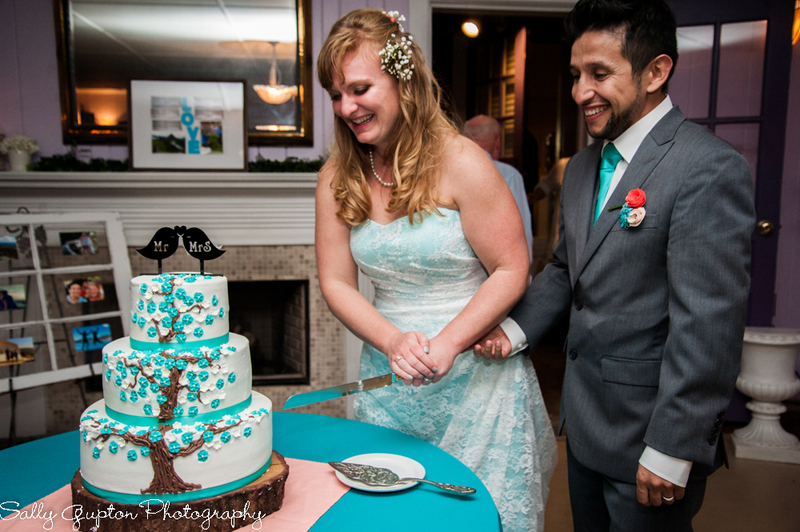 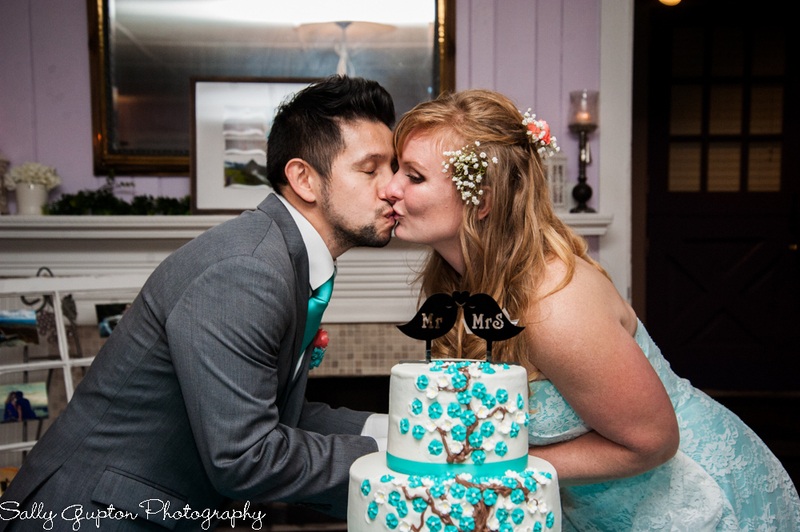 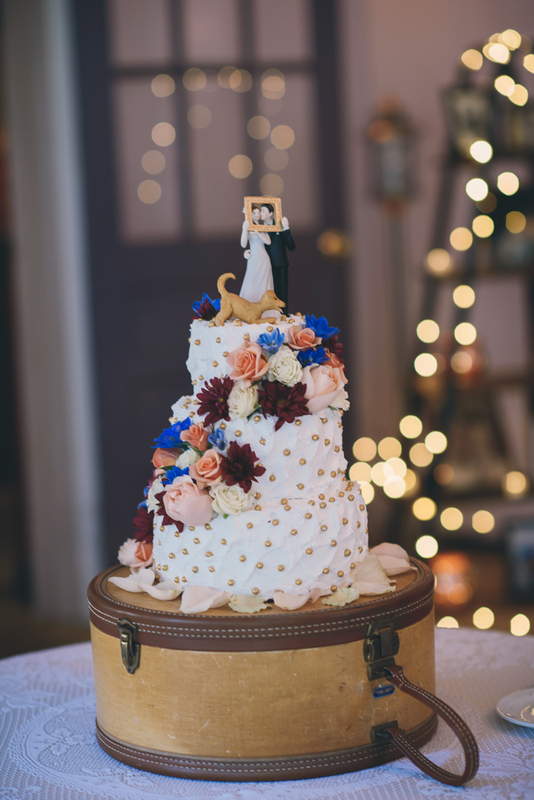 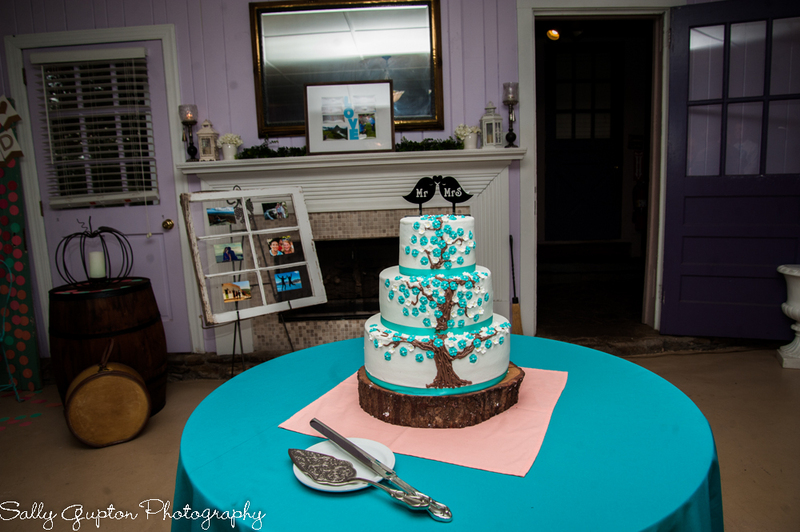 Their adorable cake was provided by the 1812 Hitching Post and featured a tree design with white and turquoise sugar flowers and ribbon. 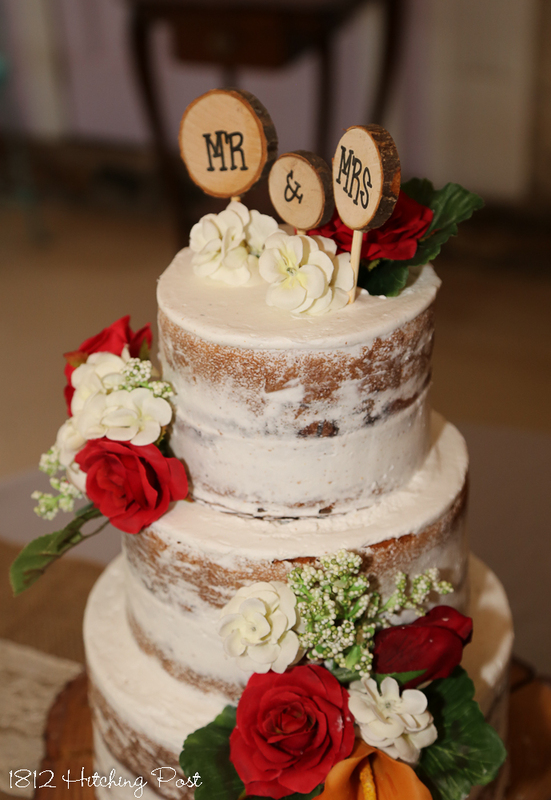 The cake flavors were coconut with raspberry filling and dark chocolate with chocolate almond filling. 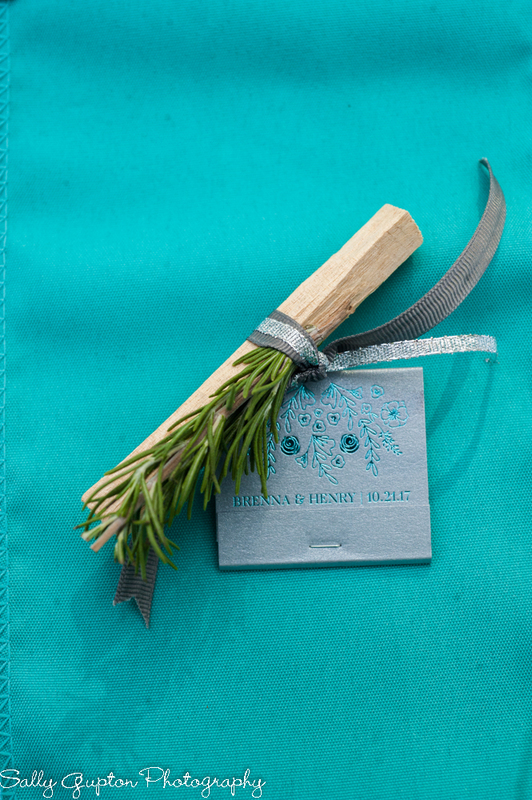 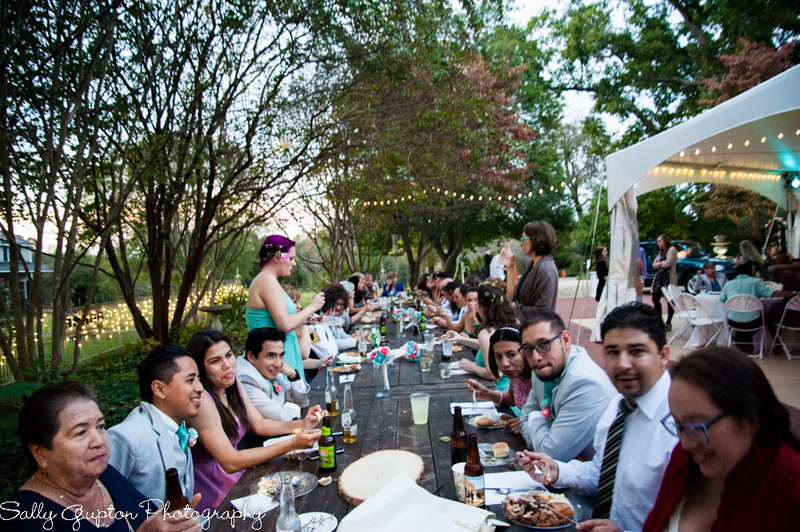 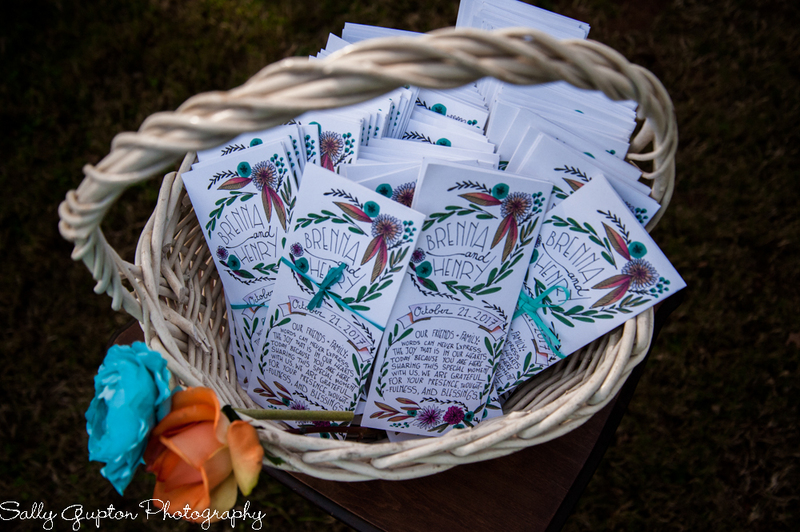 The party favors of Palo Santo wood, used for the send off, were part of the centerpieces. 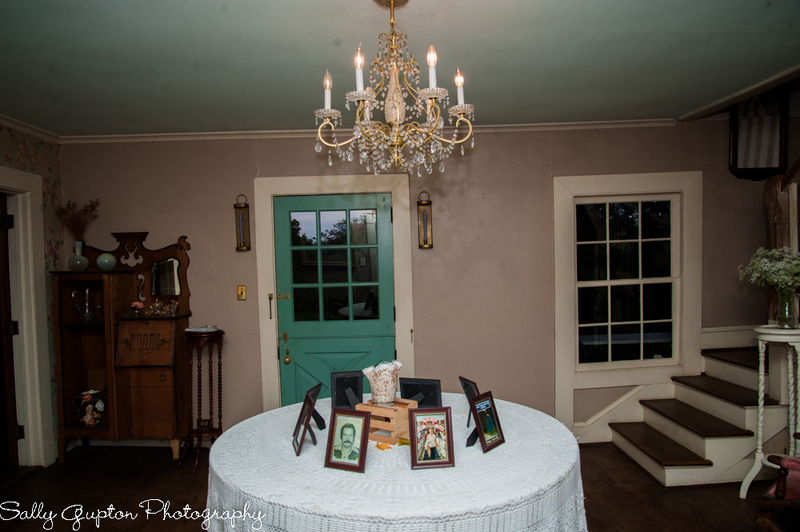 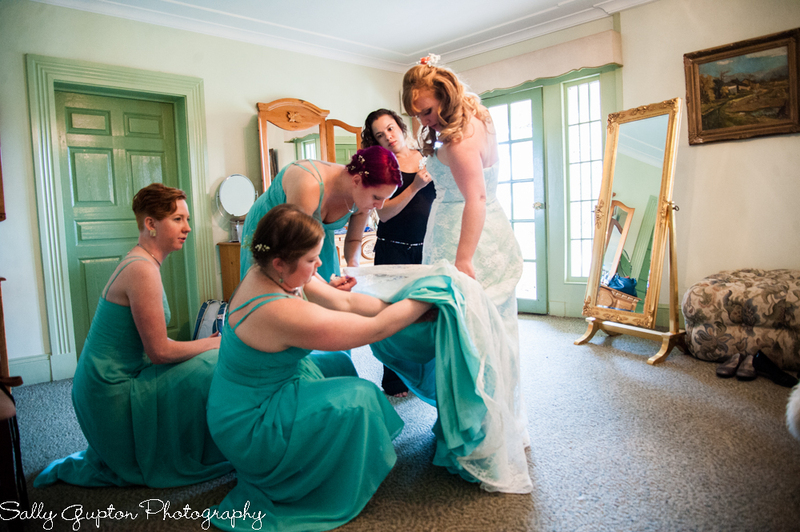 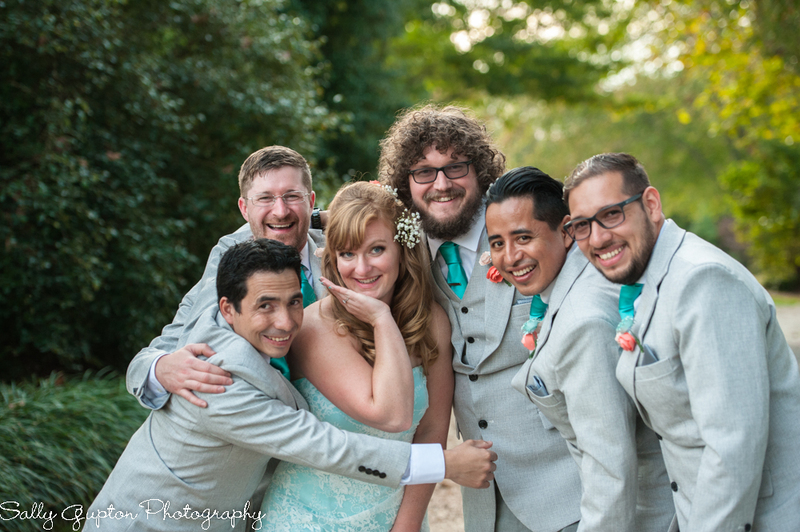 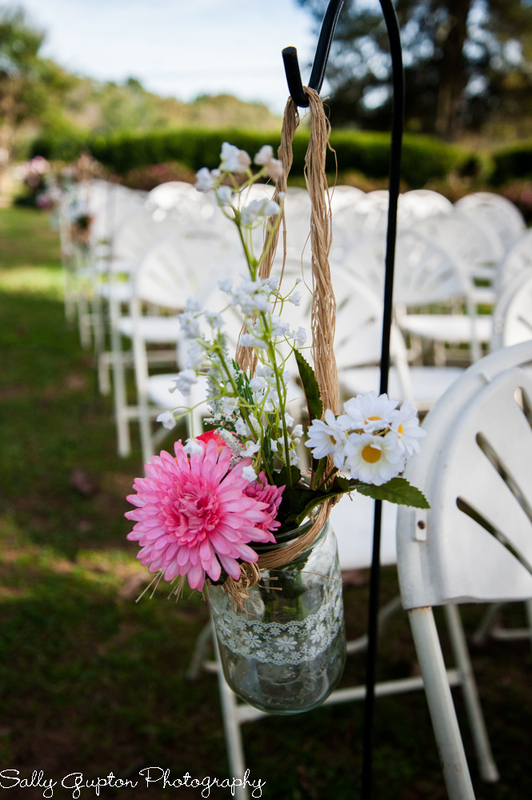 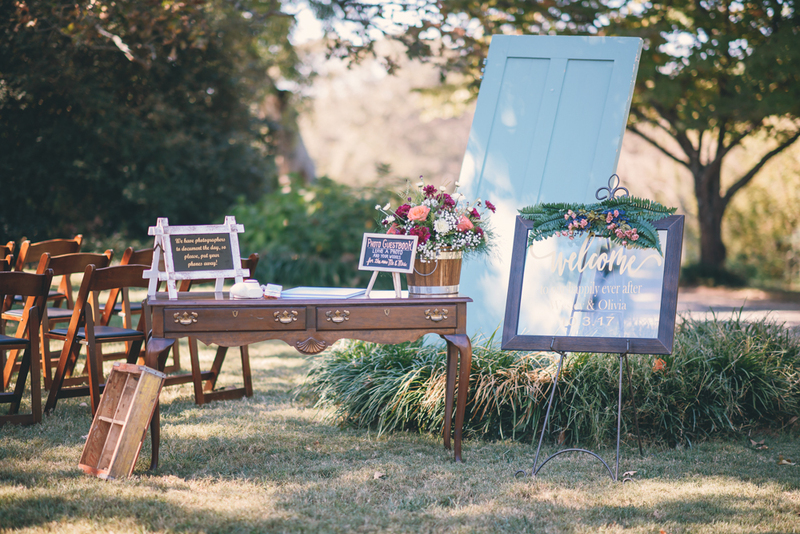 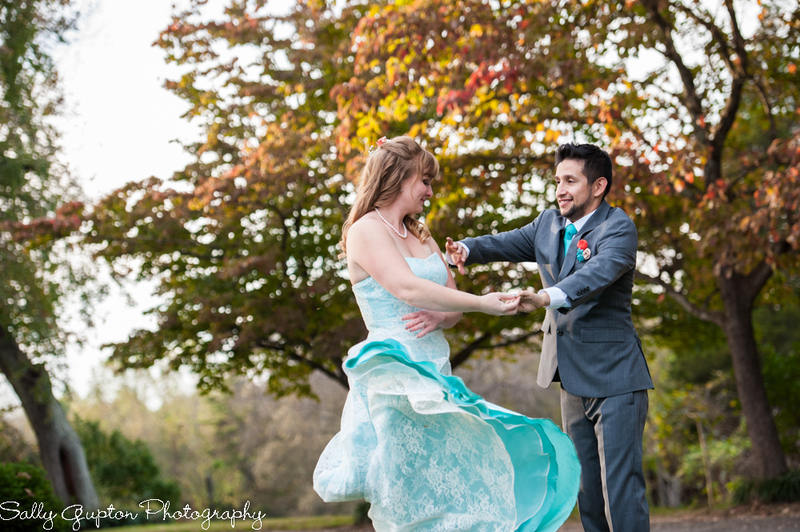 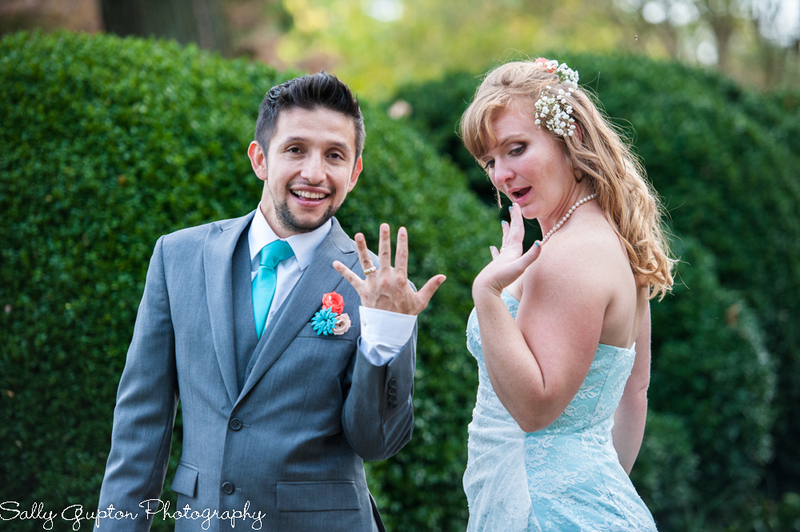 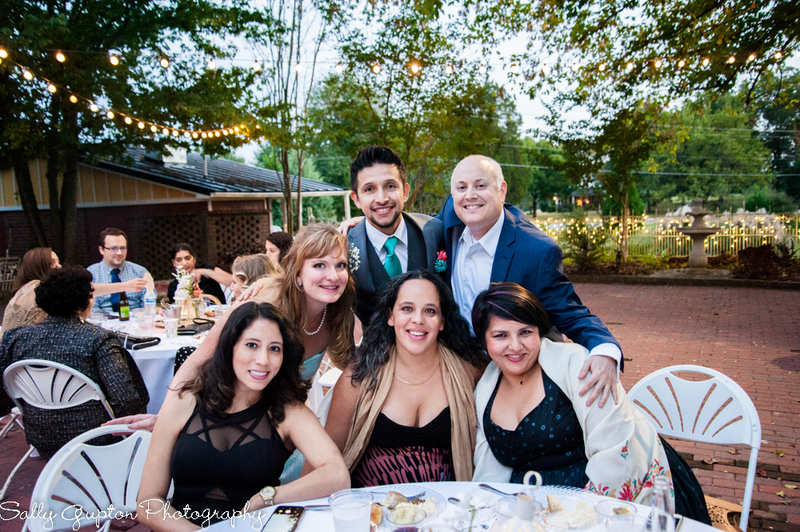 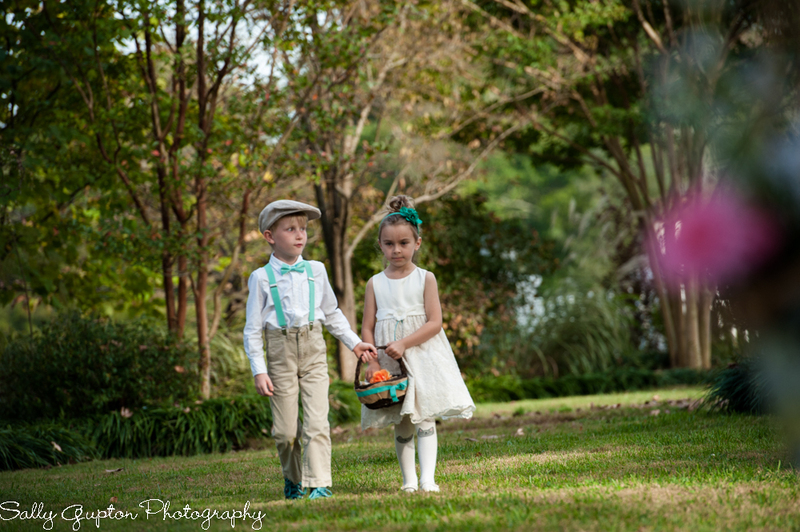 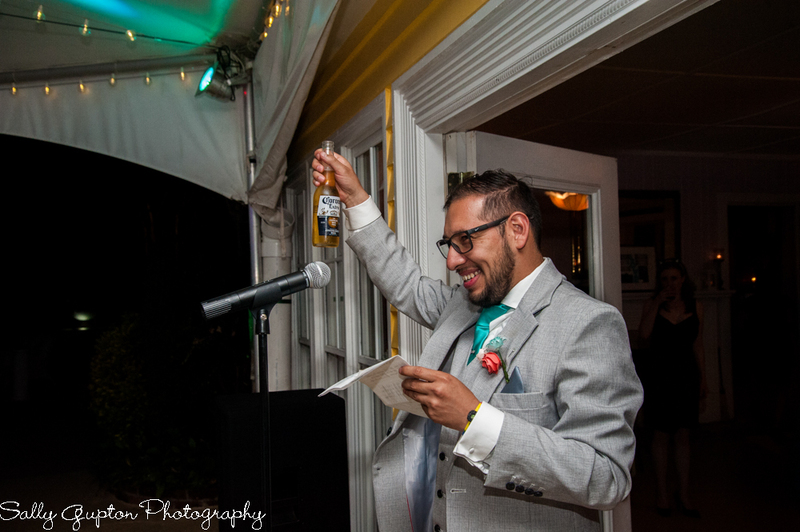 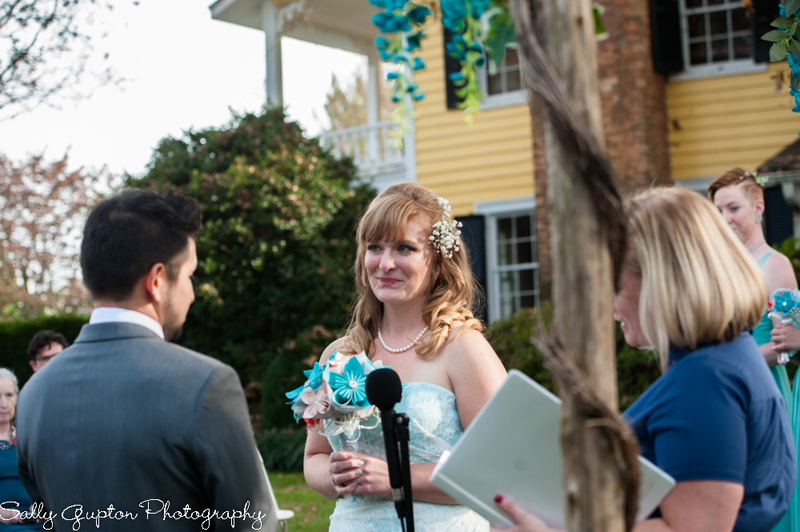 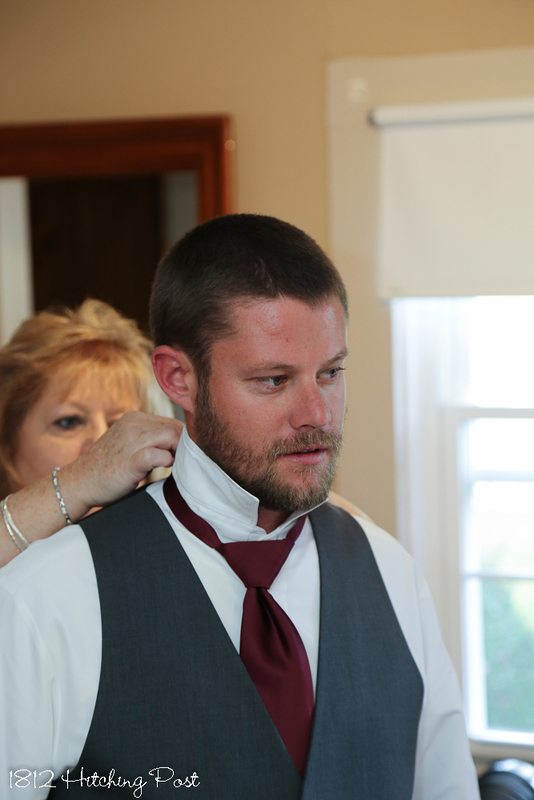 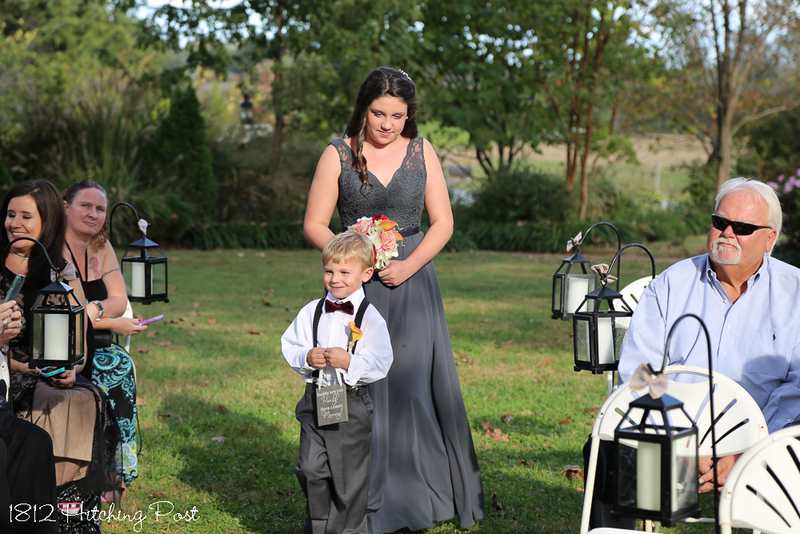 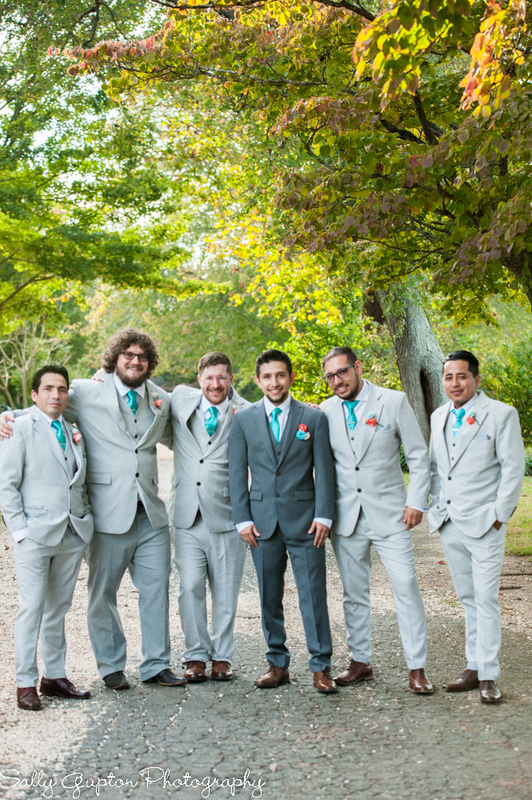 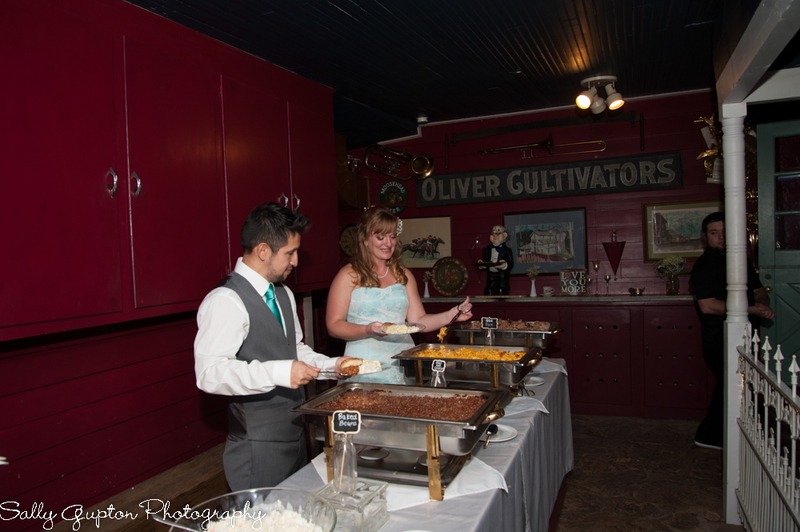 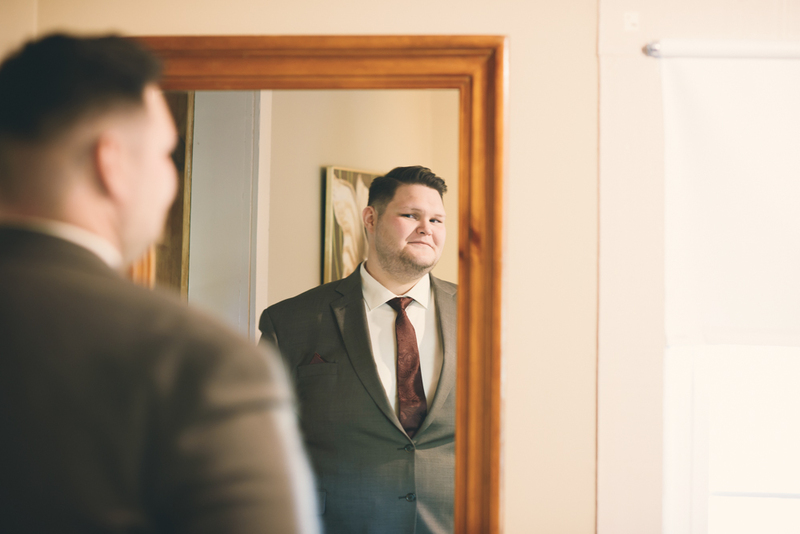 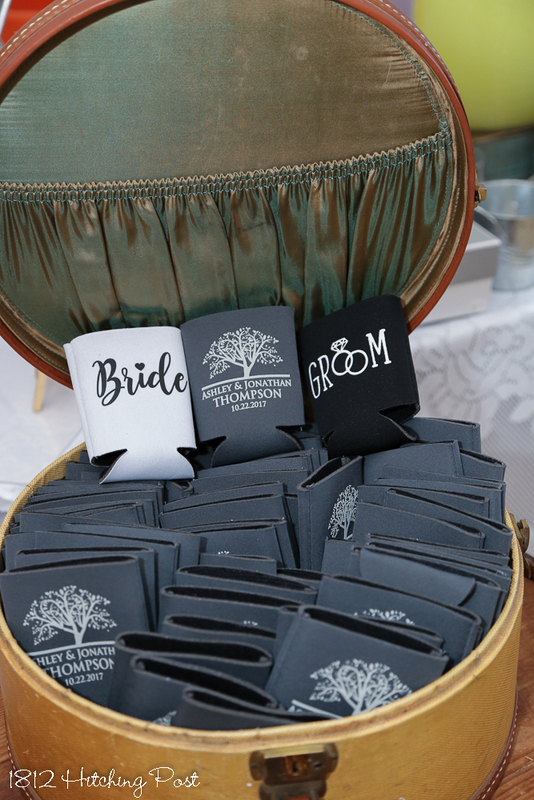 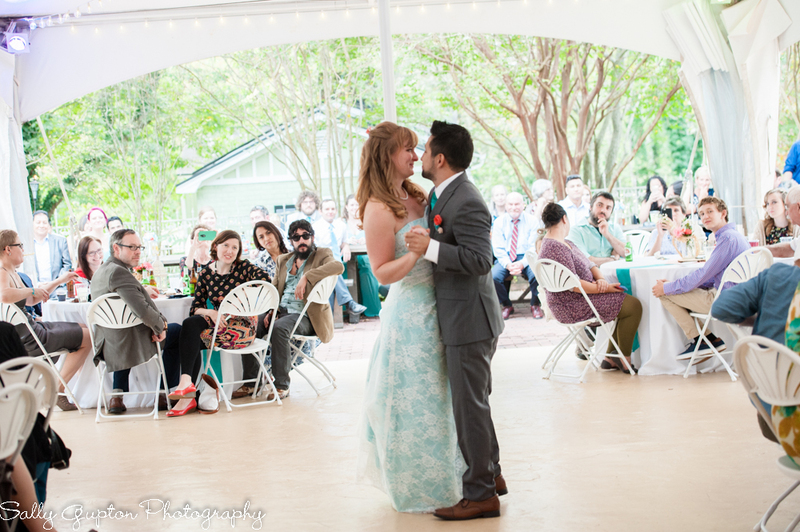 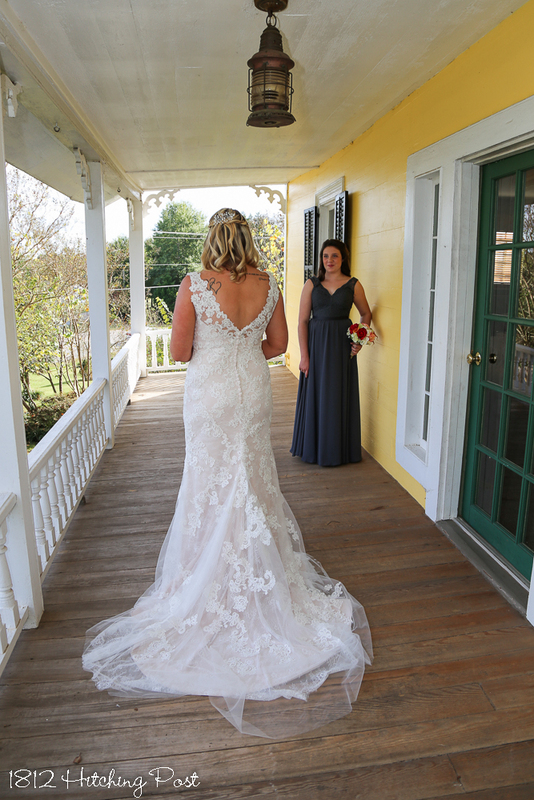 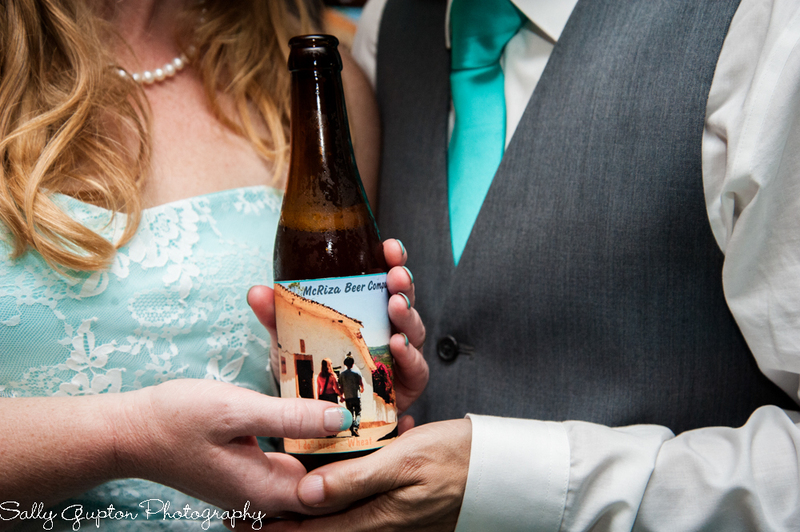 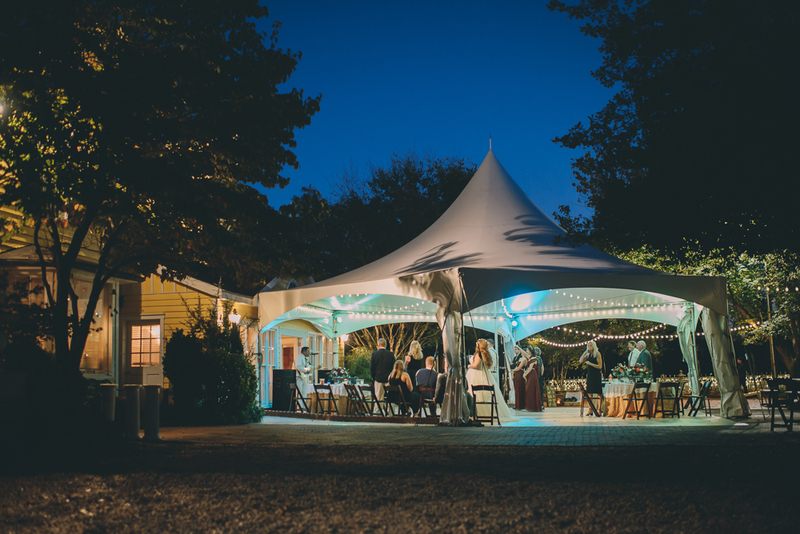 These fabulous photos were taken by Sally Gupton Photography. 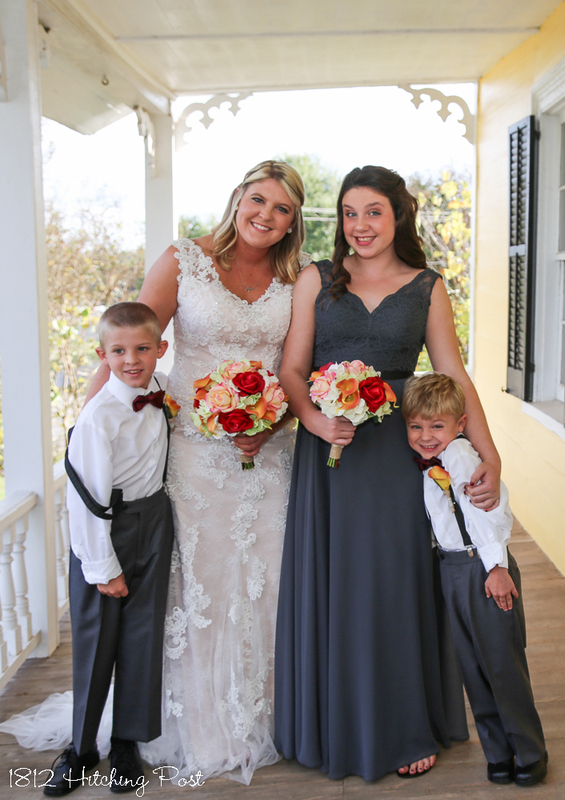 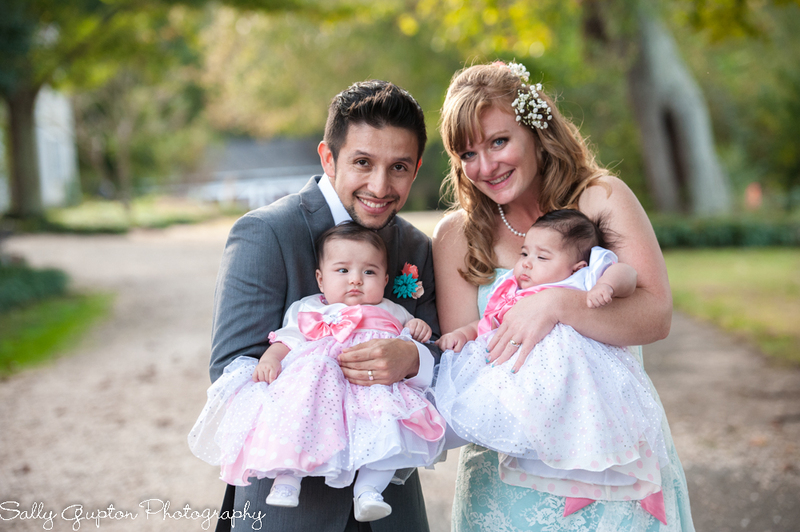 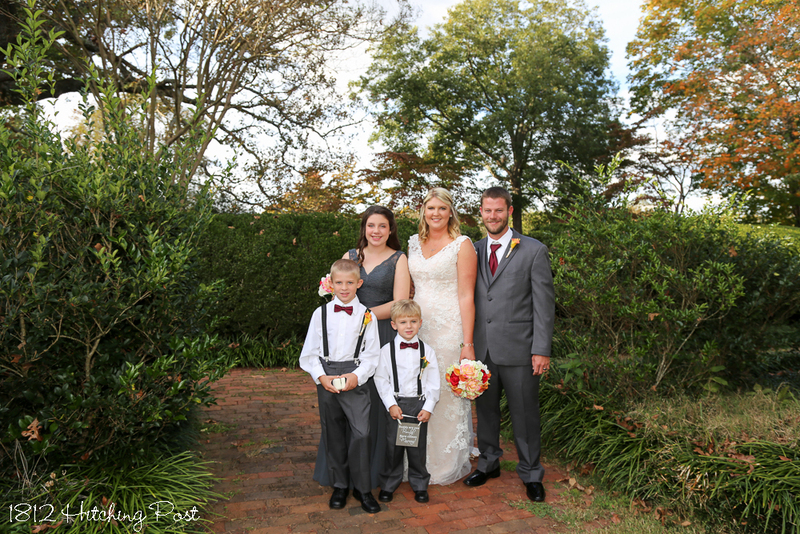 Ashley & Jonathan had a lovely wedding the third Sunday in October that featured Ashley’s three children. 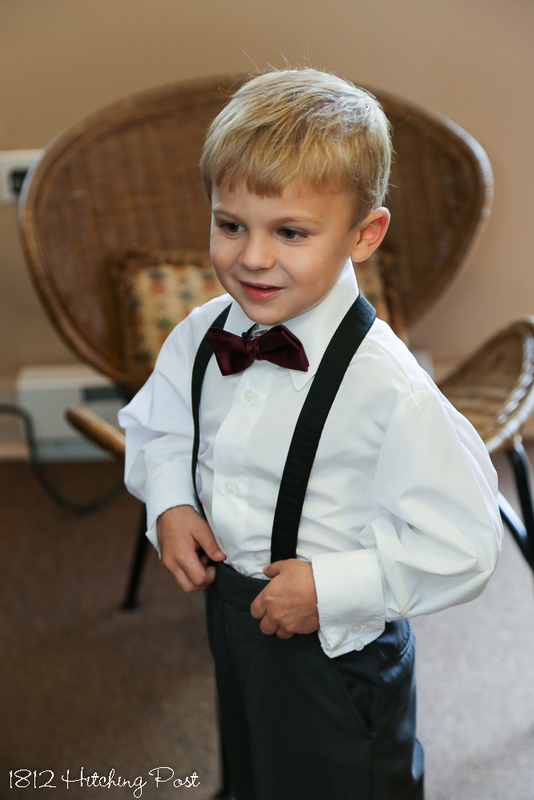 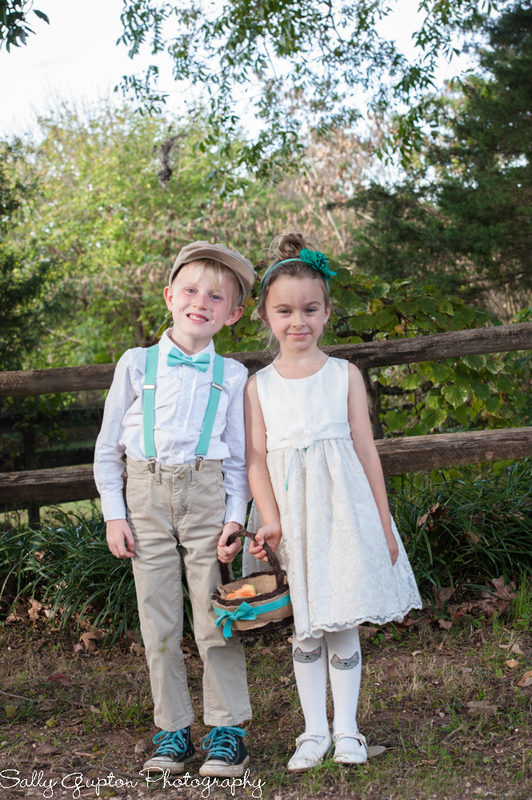 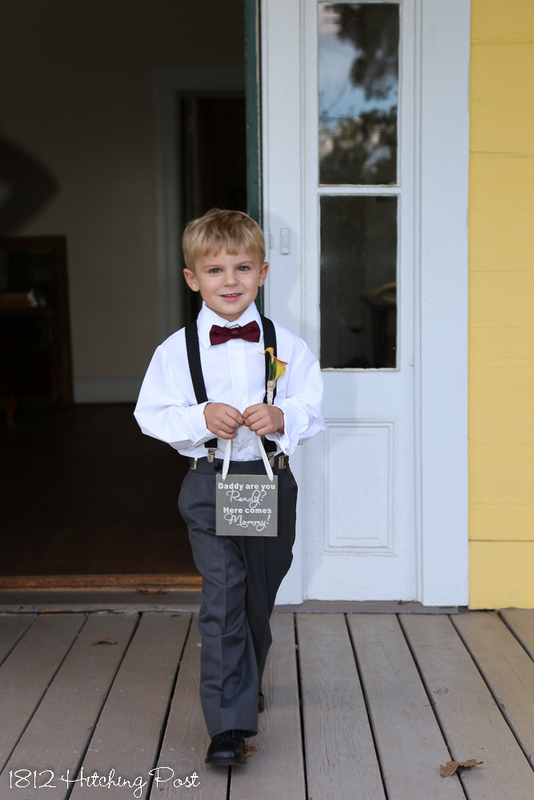 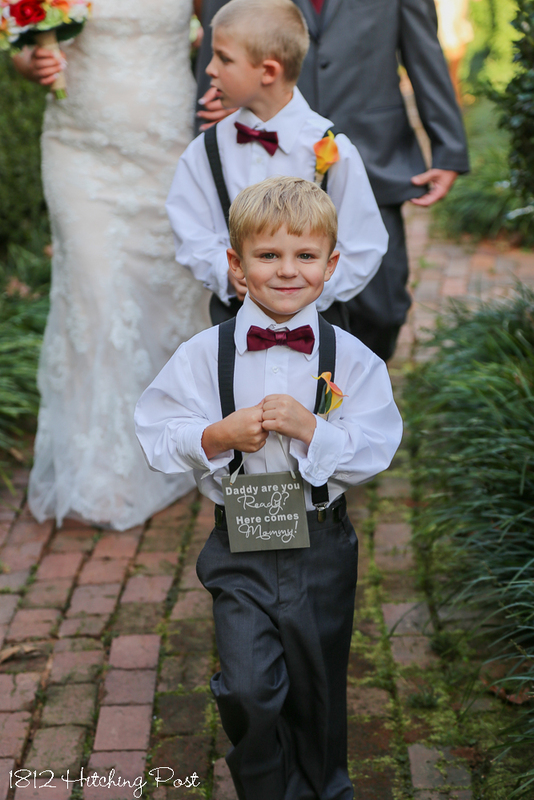 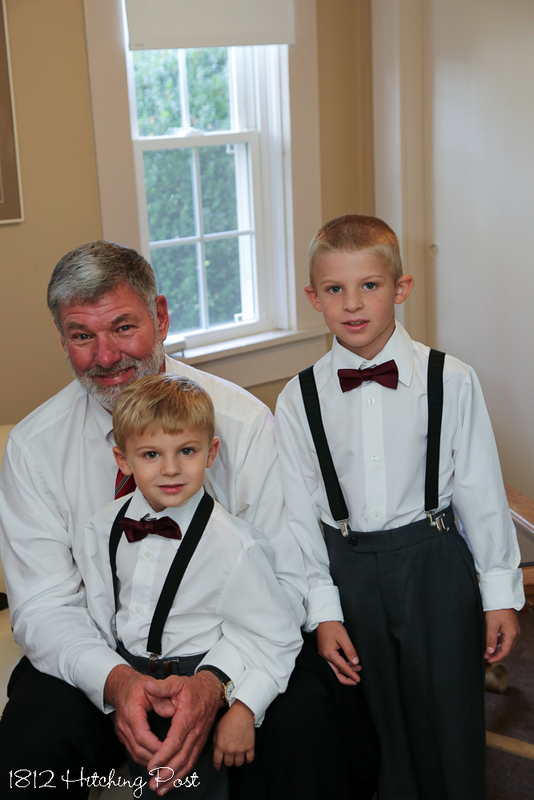 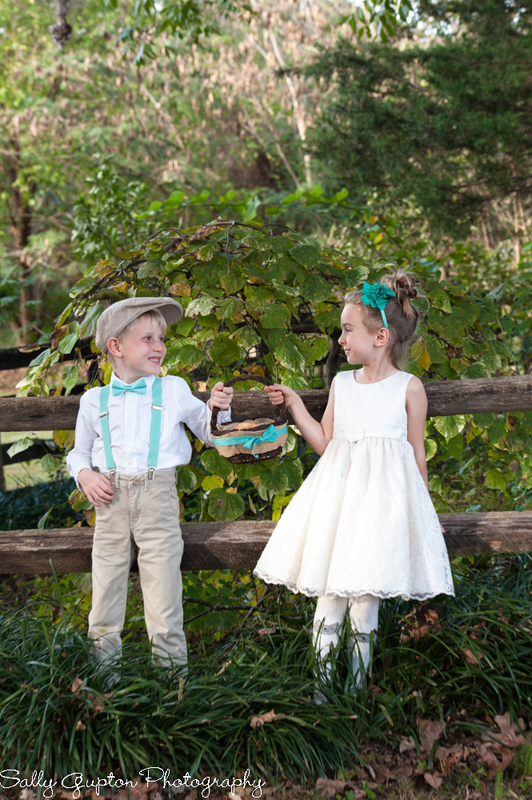 Her daughter wore a charcoal gray dress and her boys wore cute suspender outfits. 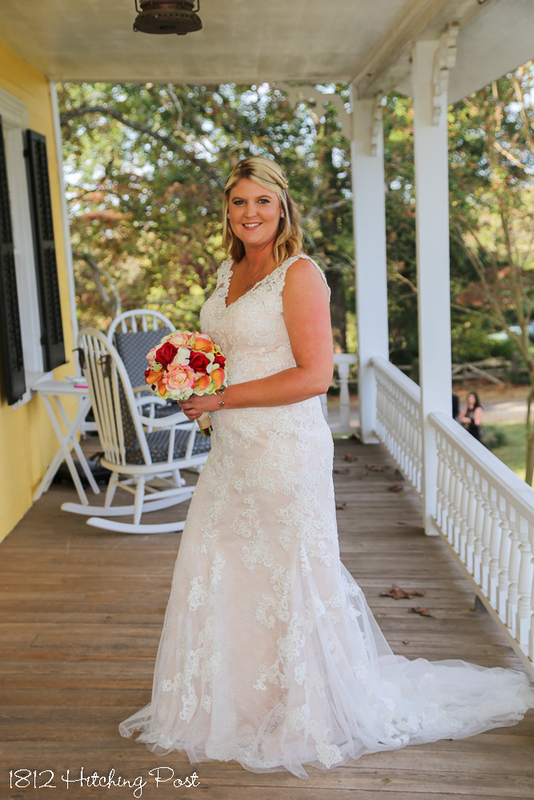 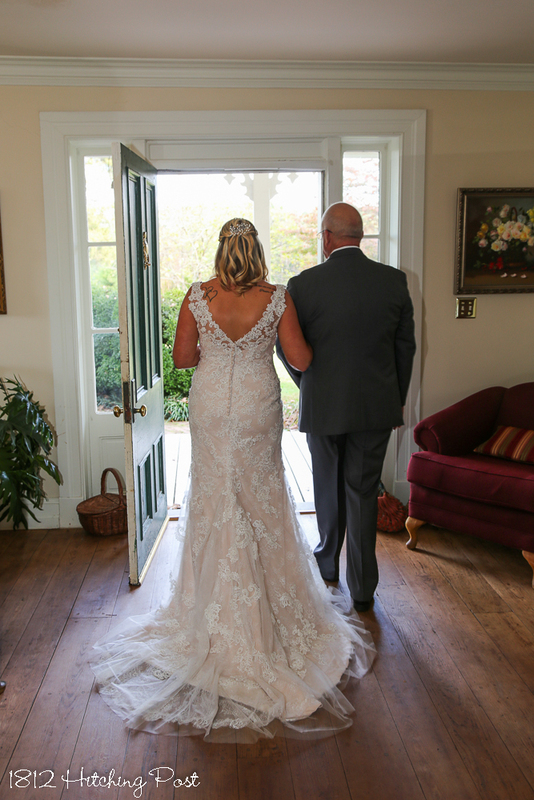 Ashley’s dress was a gorgeous blush with lace overlay. 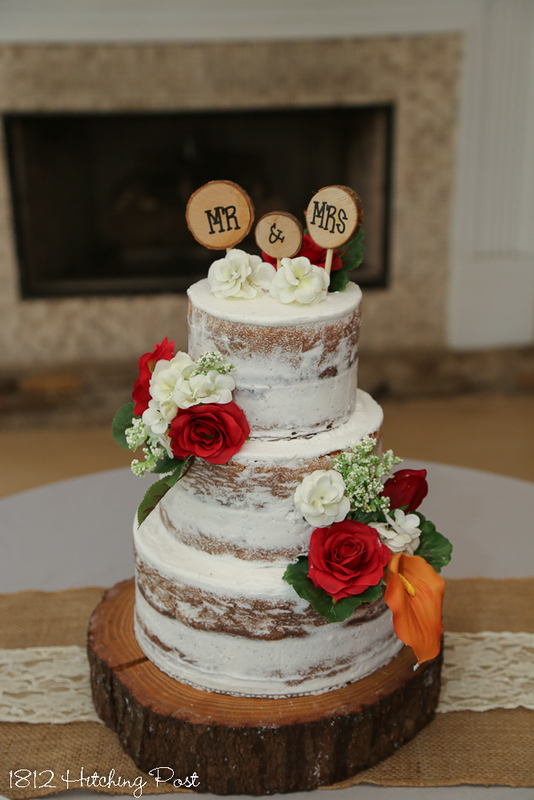 The arbor and “almost naked” cake were decorated with fall flowers in orange, yellow, cranberry, and pink. 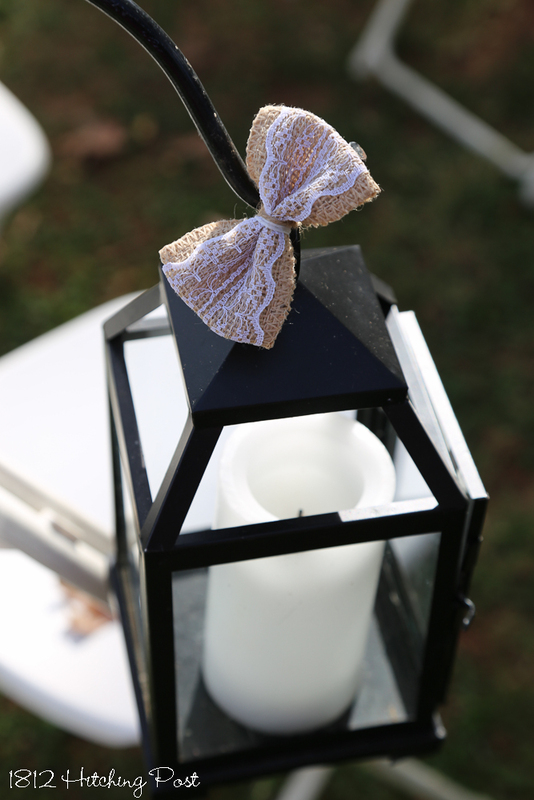 Black lanterns hung on the aisle with burlap and lace bows and the tables were decorated with burlap and lace runners over gray. 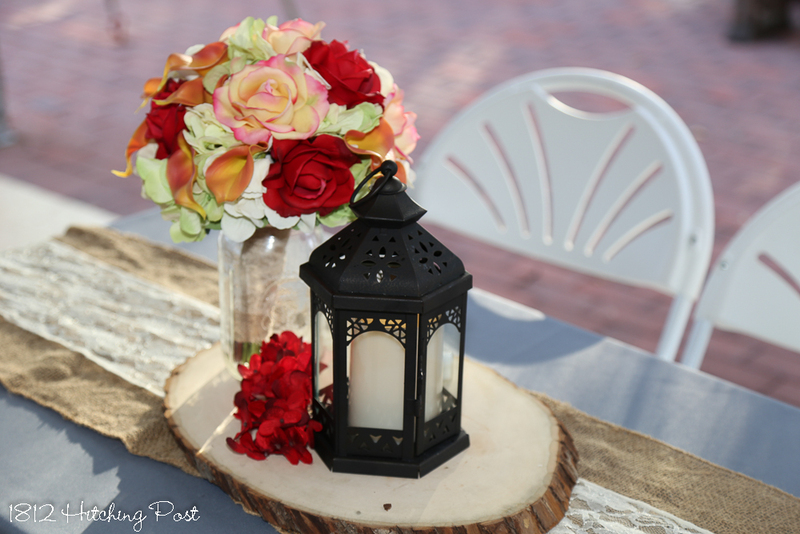 Centerpieces were a trio of vases with candles and popcorn. 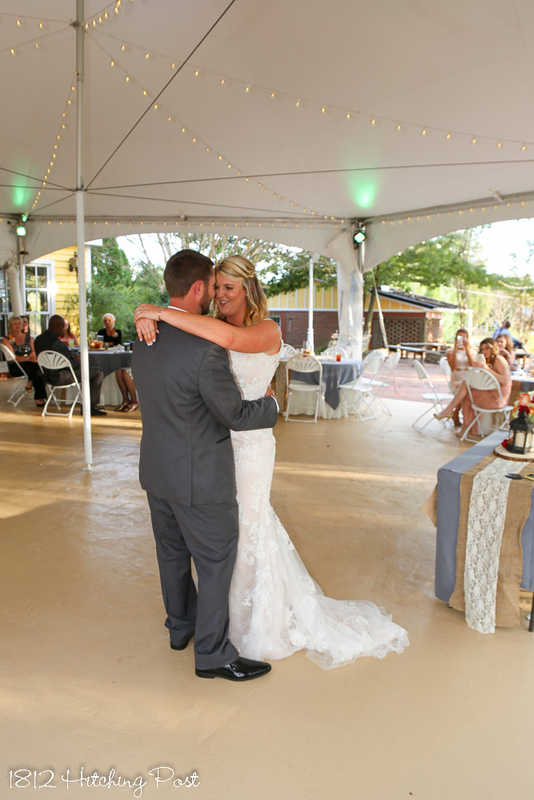 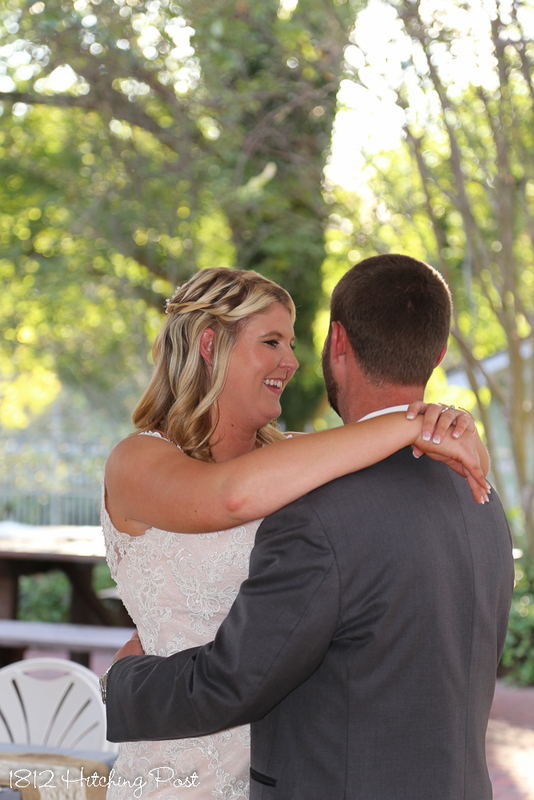 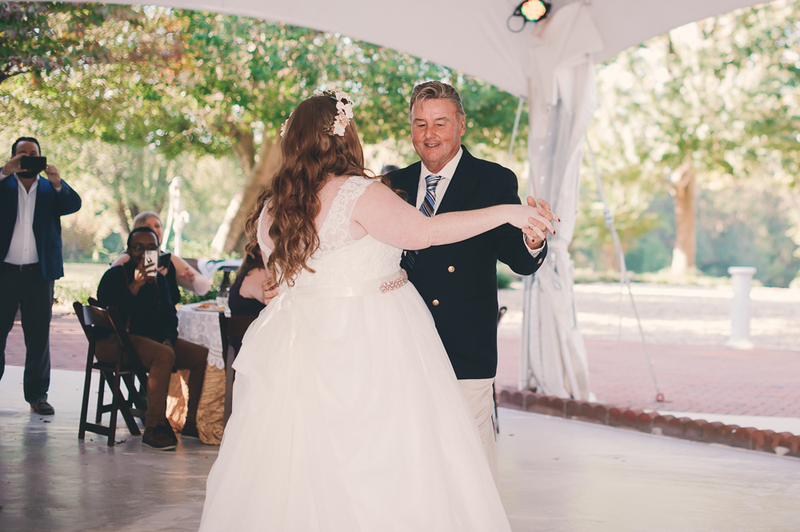 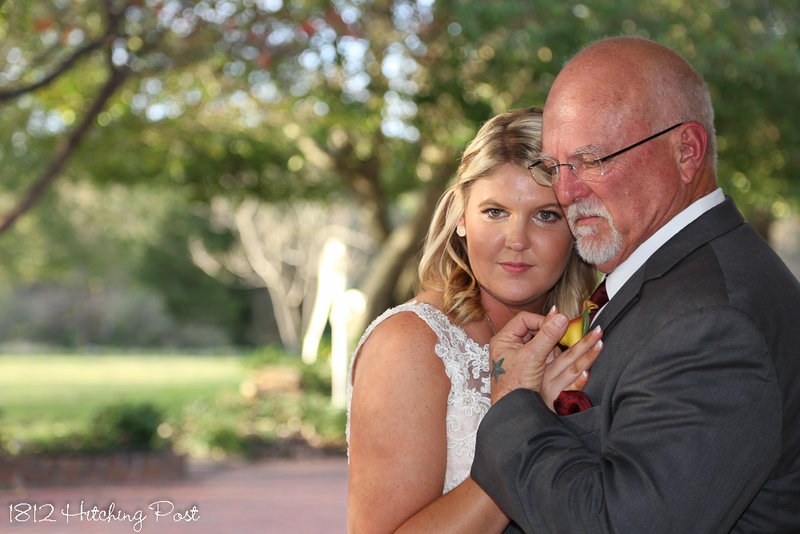 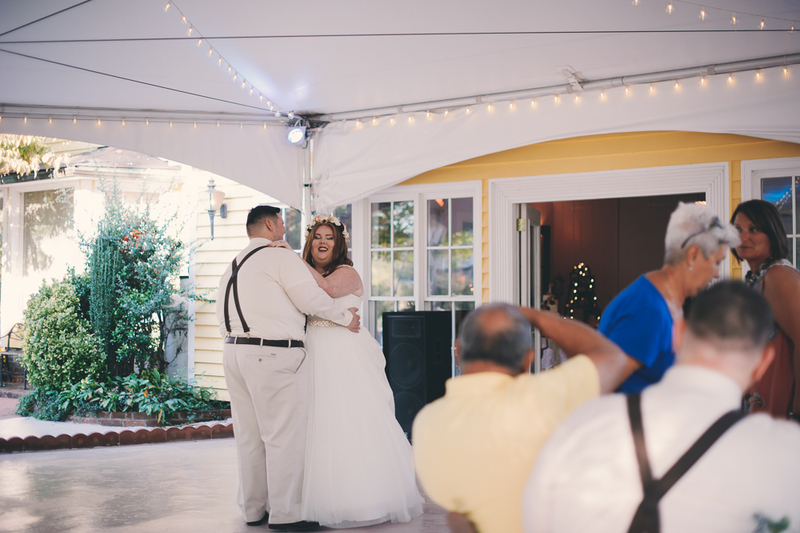 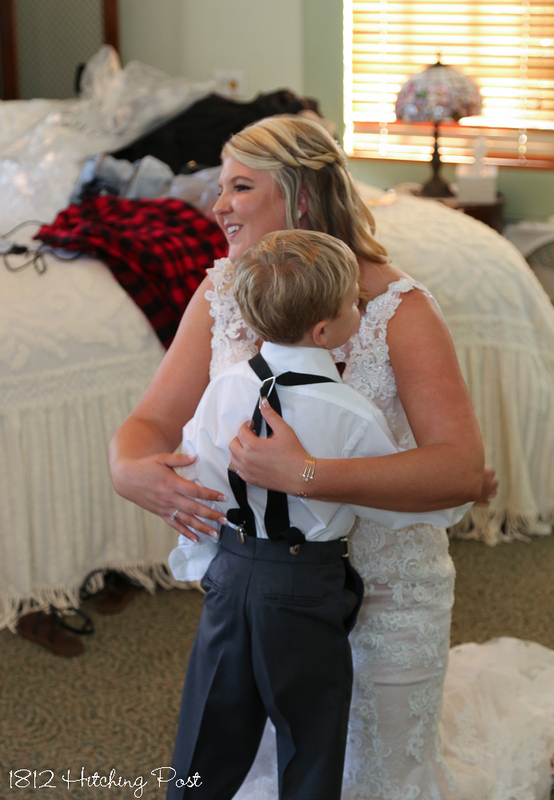 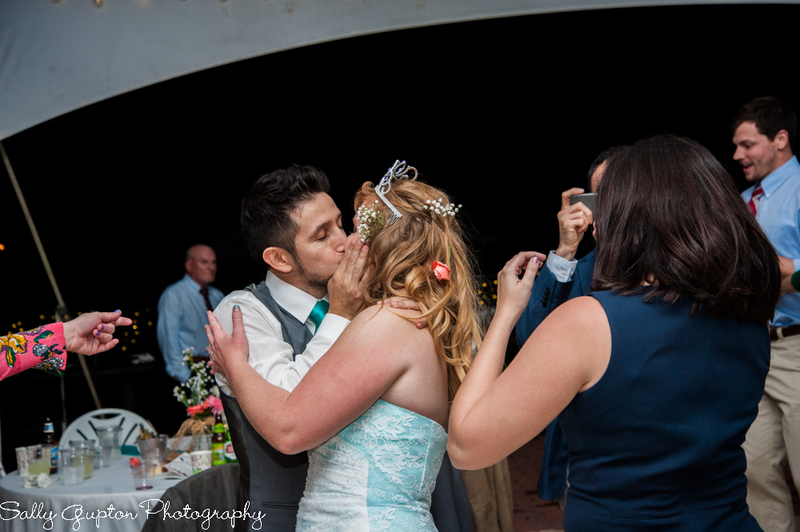 After being announced to their reception, Ashley and Jonathan danced to Garth Brooks “To Make you Feel My Love.” Ashley and her father danced to “Daddy” by Abby Anderson. 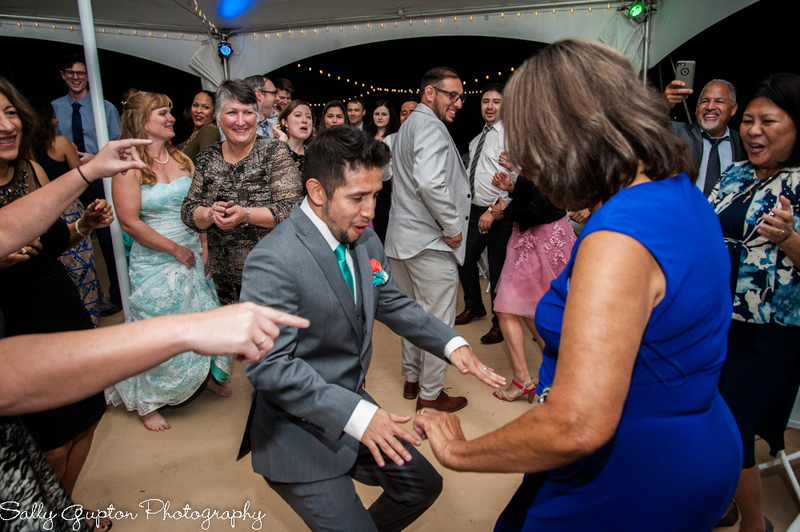 Jonathan and his mom danced to “I’ll Always be Your Mom” by Aimee Zimmerman. 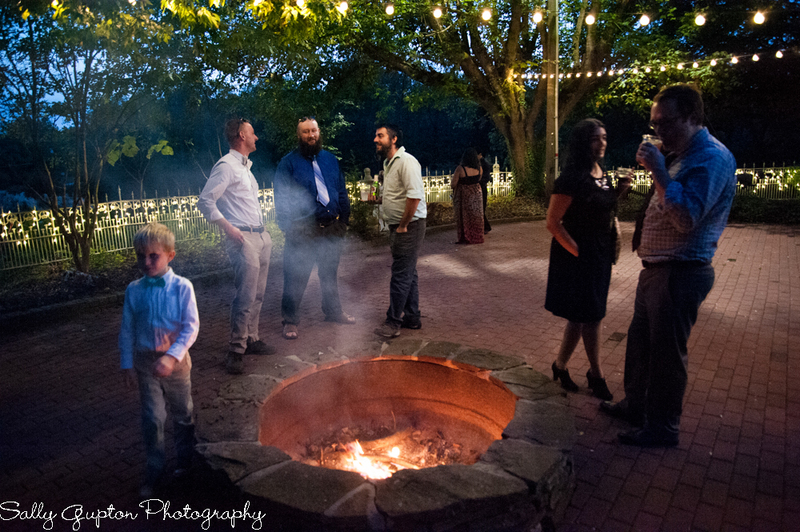 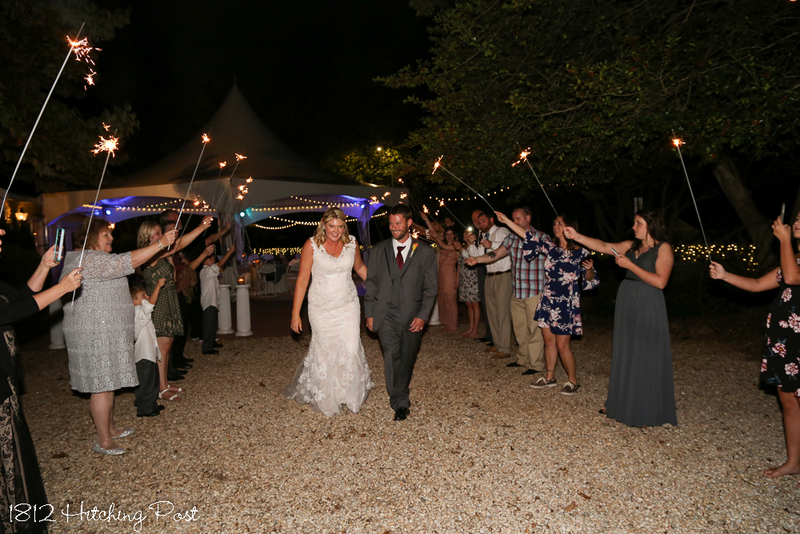 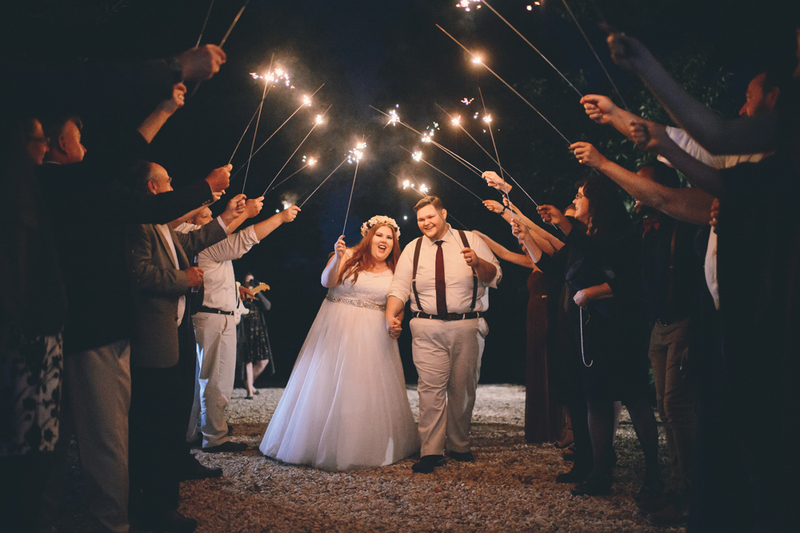 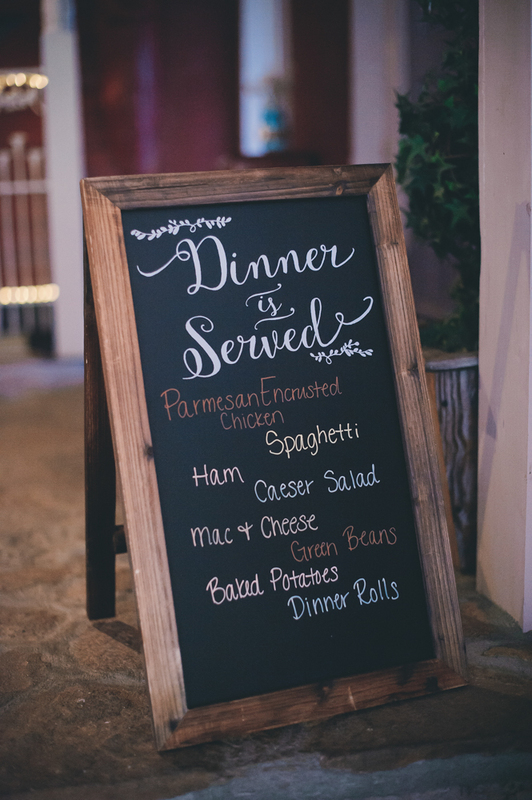 The couple had a sparkler send-off after a wonderful reception featuring appetizers of salad bar, fruit, and bar snacks and a buffet of BBQ chicken, bacon wrapped pork tenderloin, baked potato bar, mac and cheese, and baked beans. 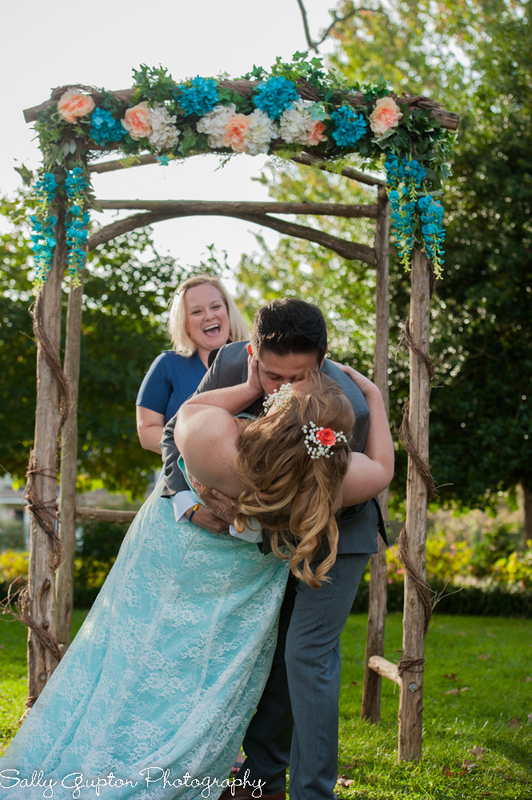 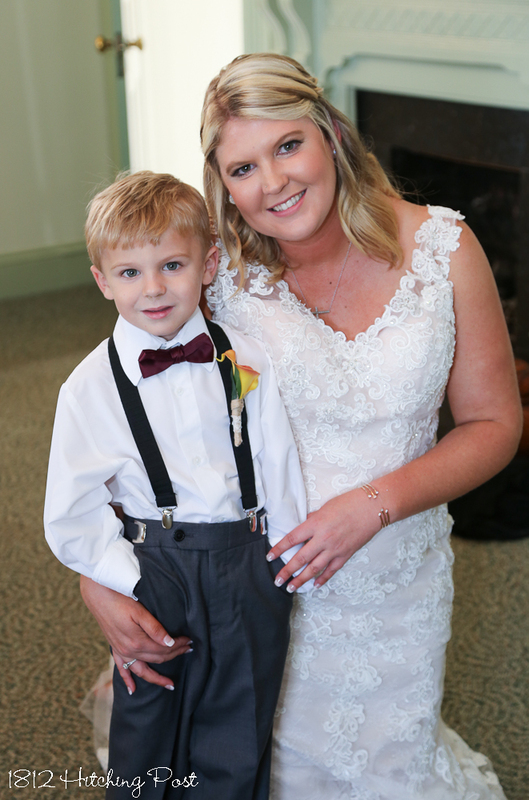 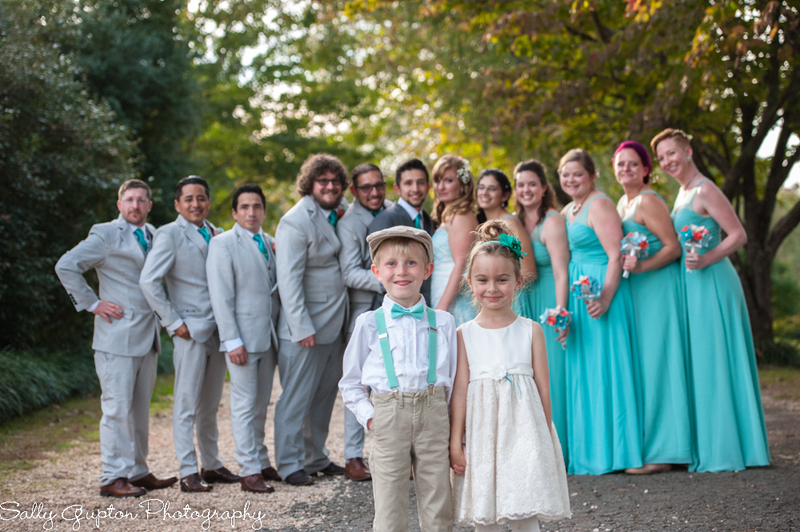 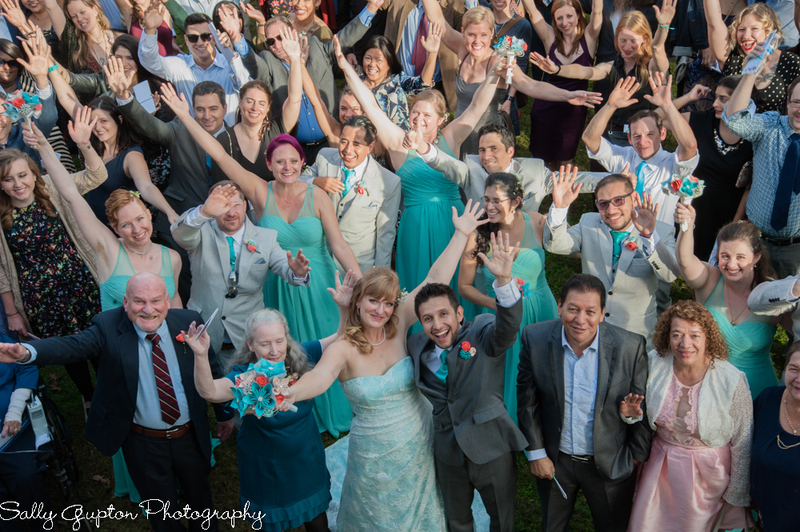 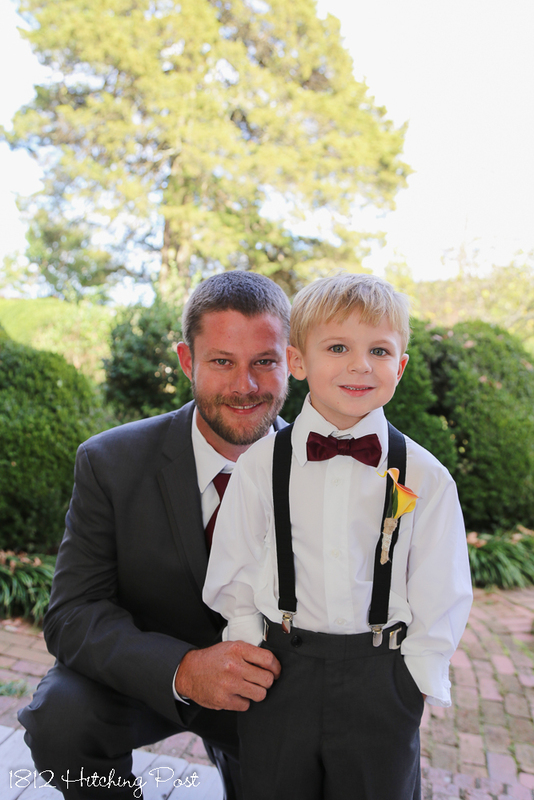 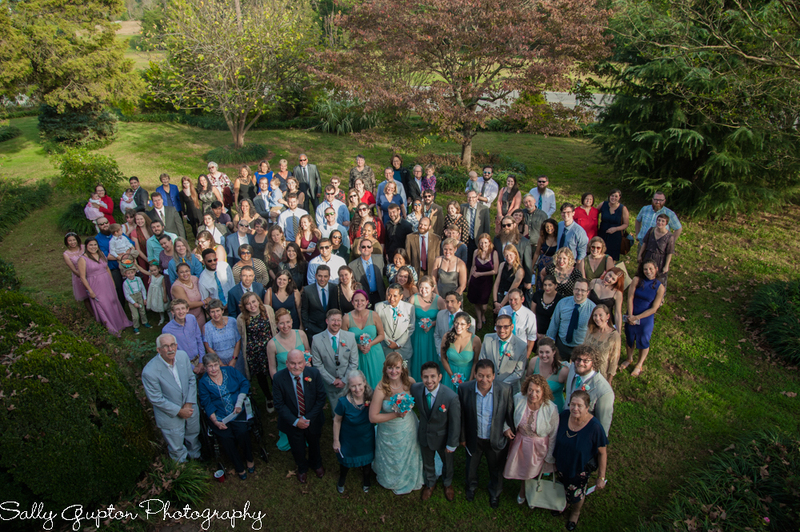 It was a fun and kid-friendly wedding! 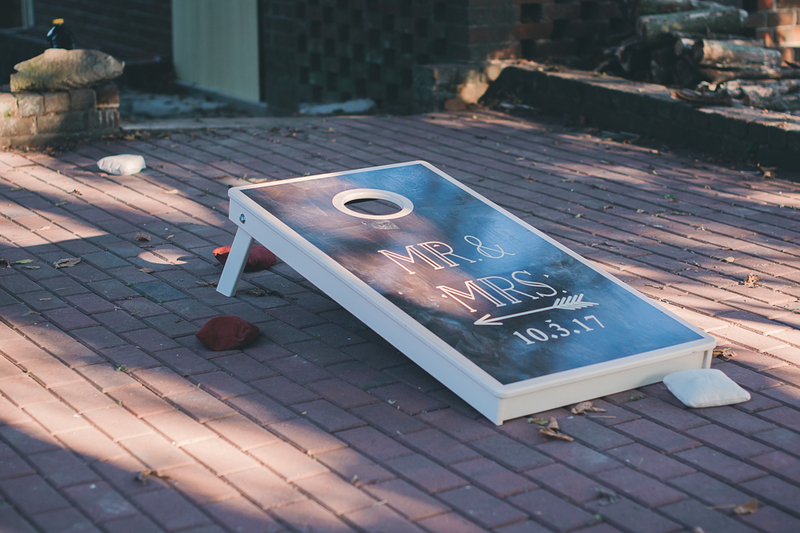 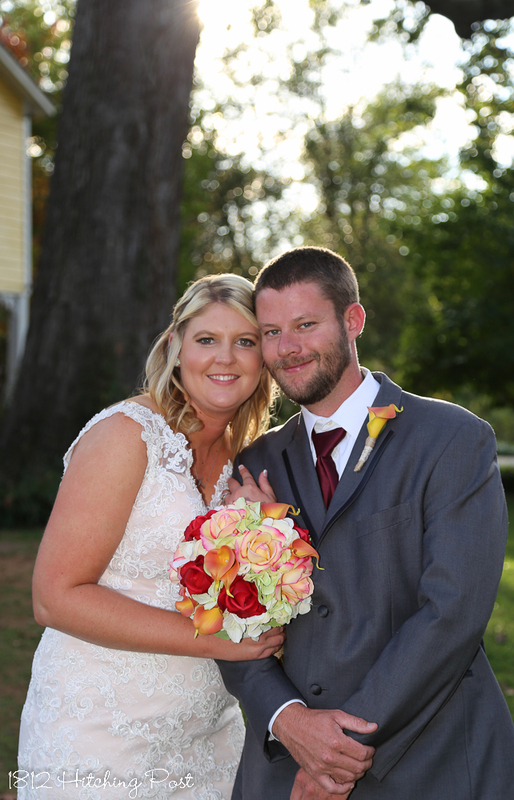 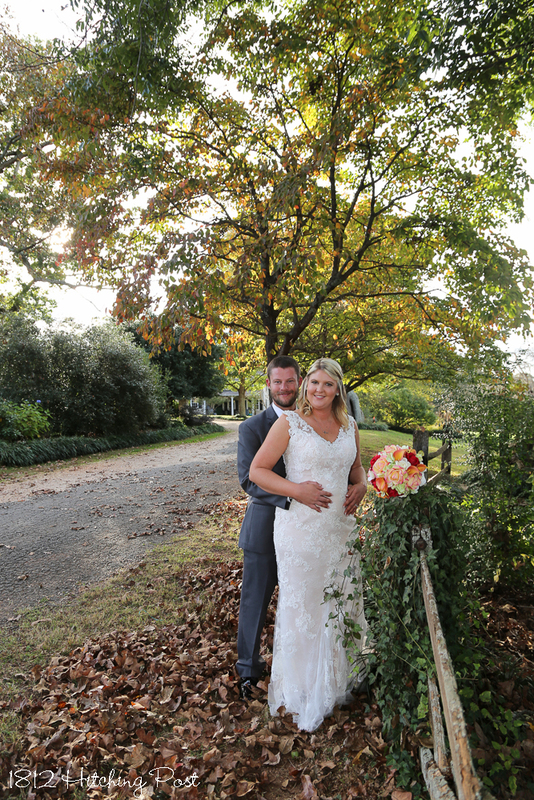 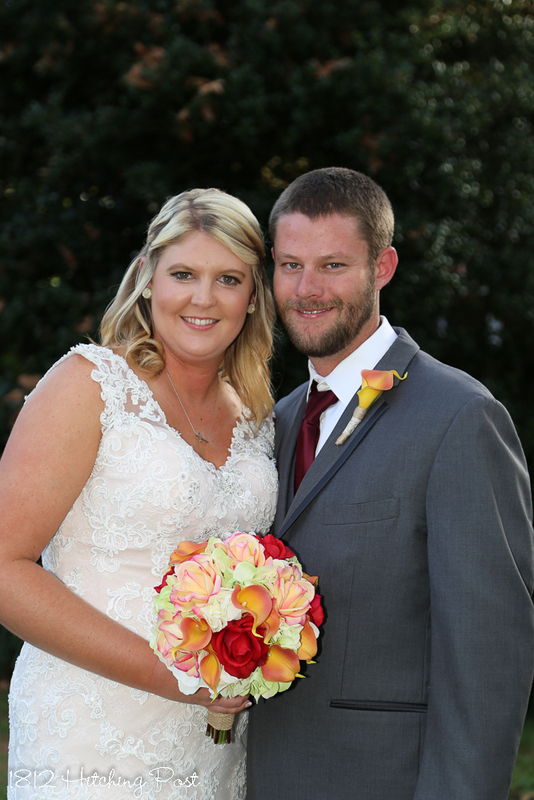 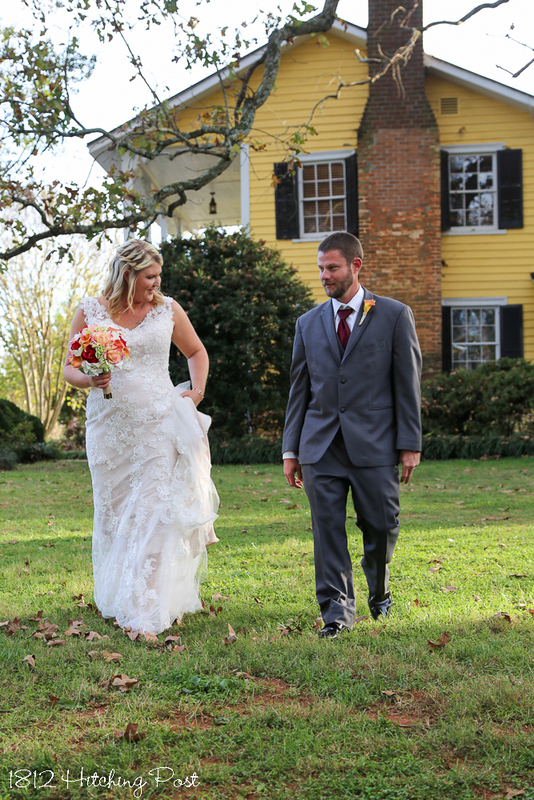 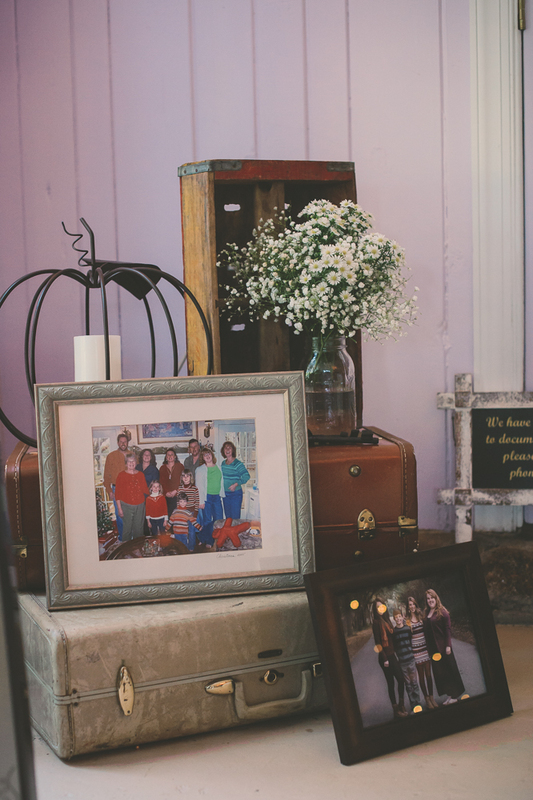 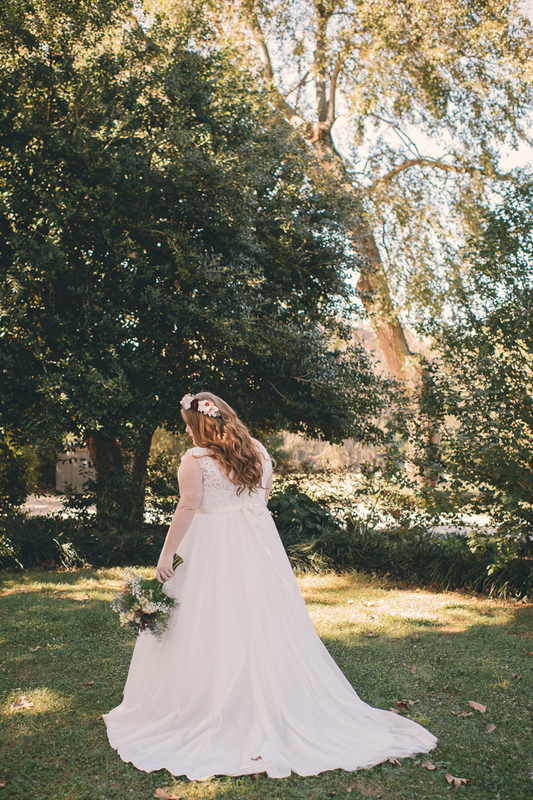 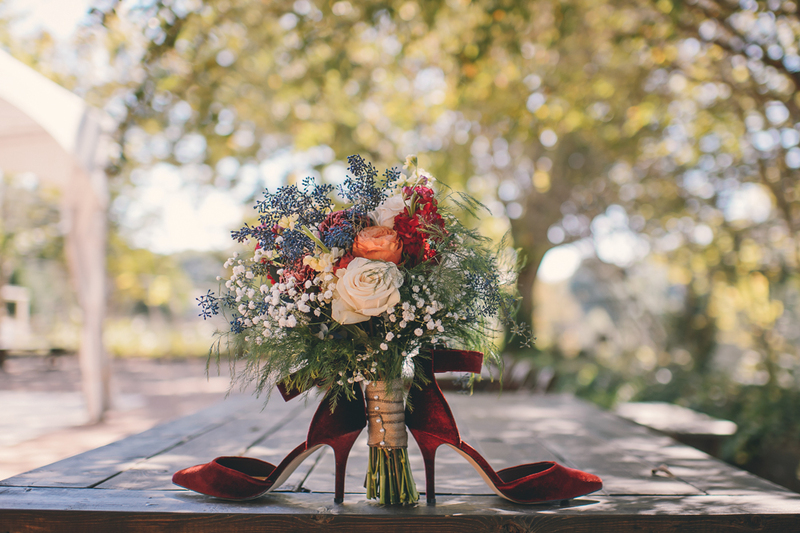 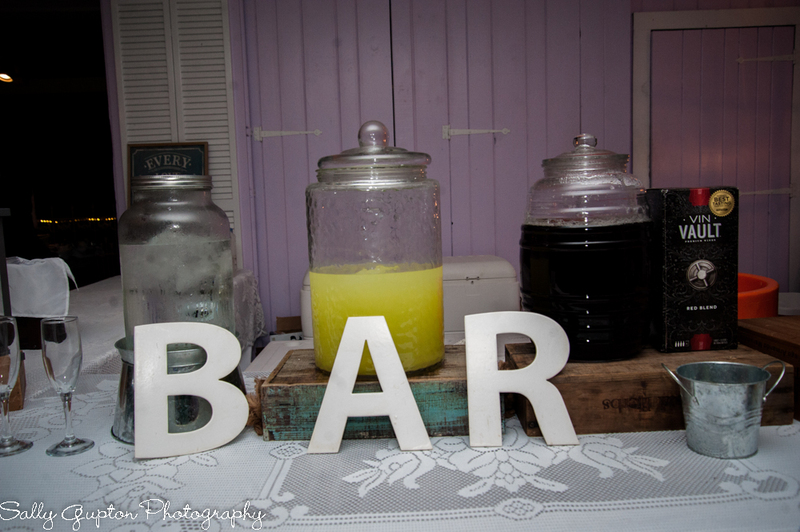 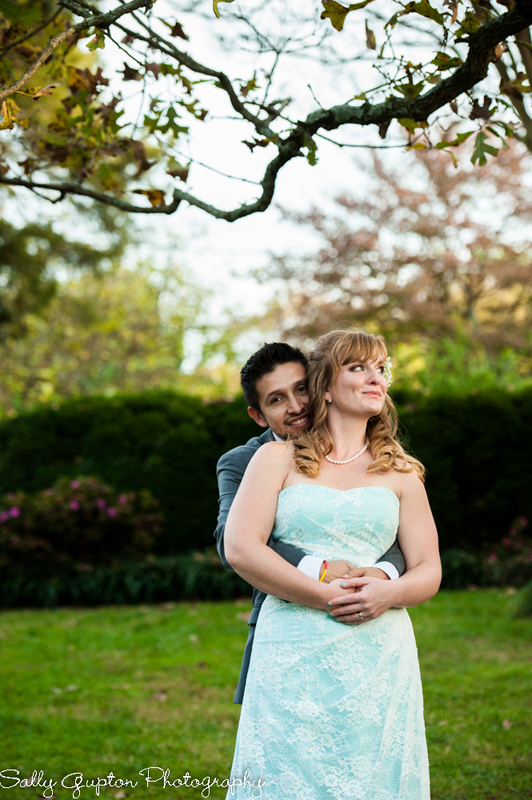 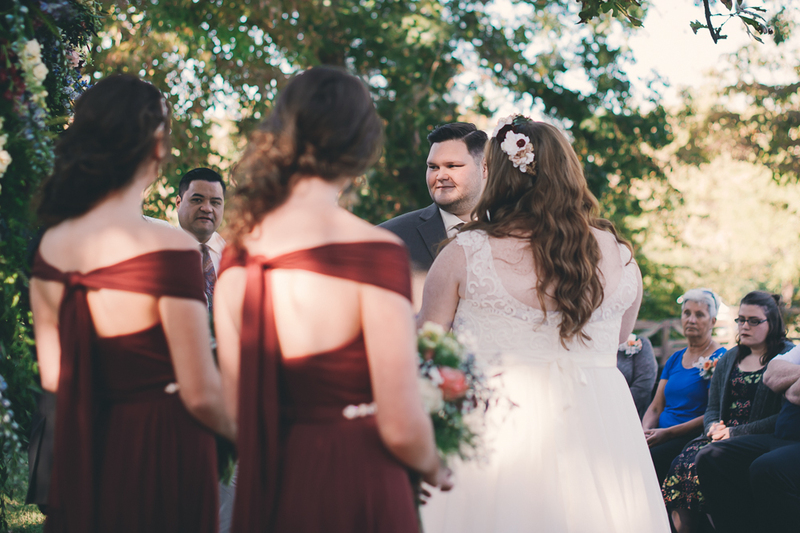 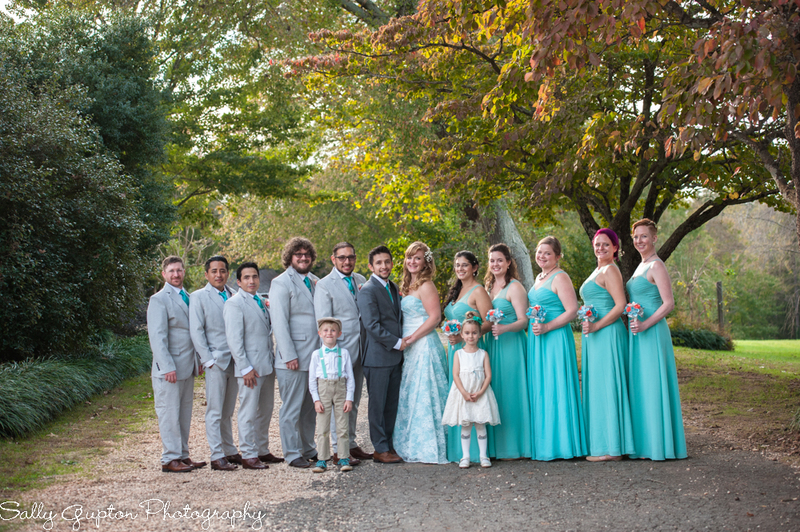 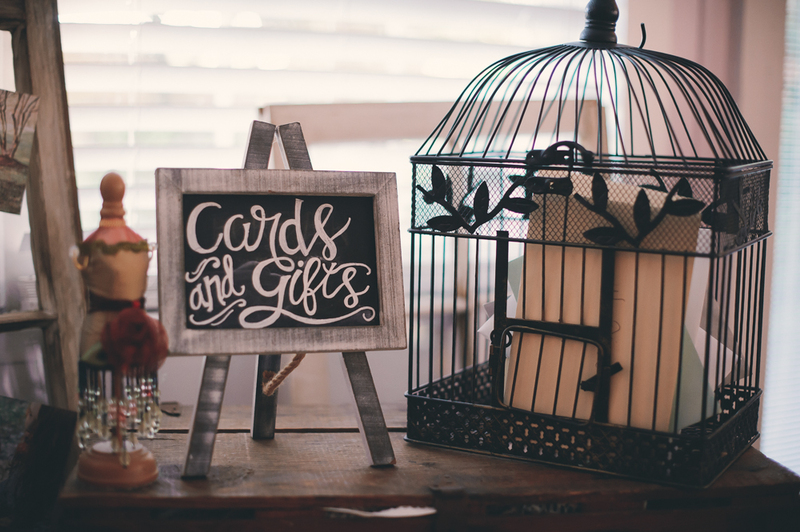 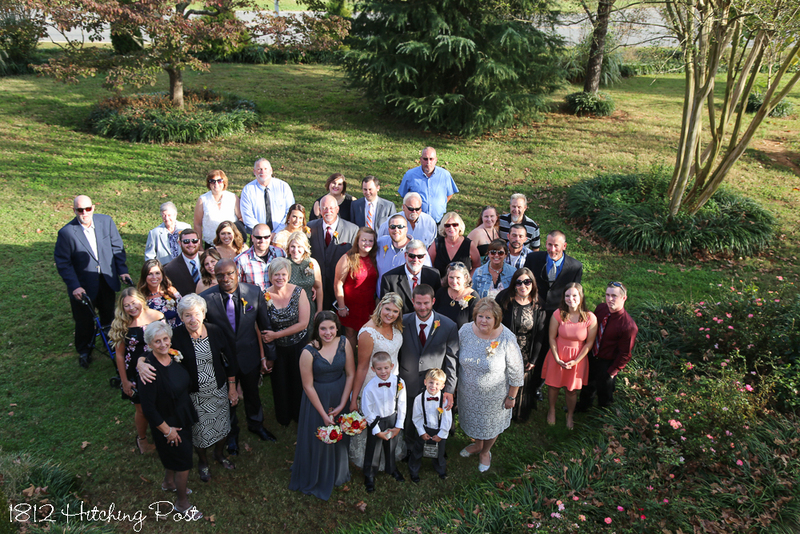 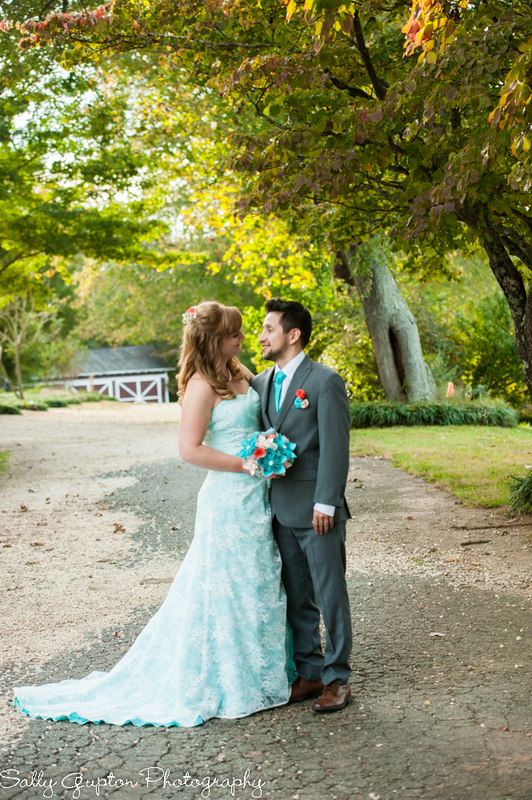 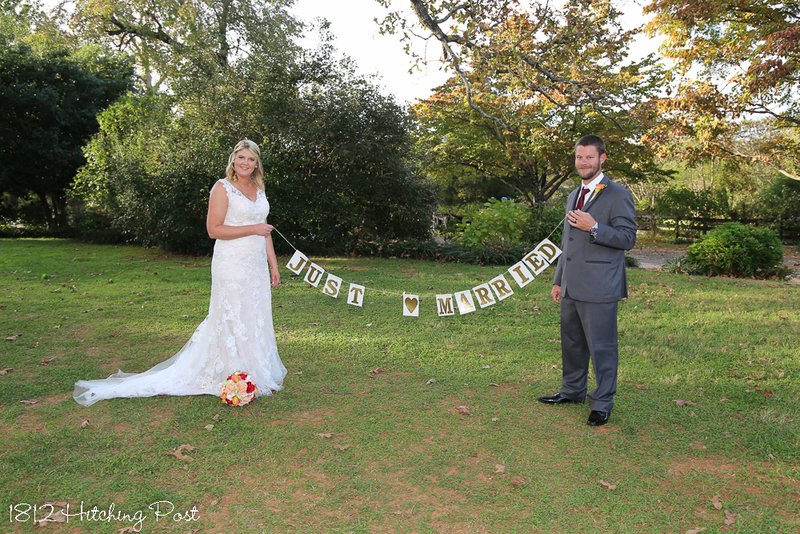 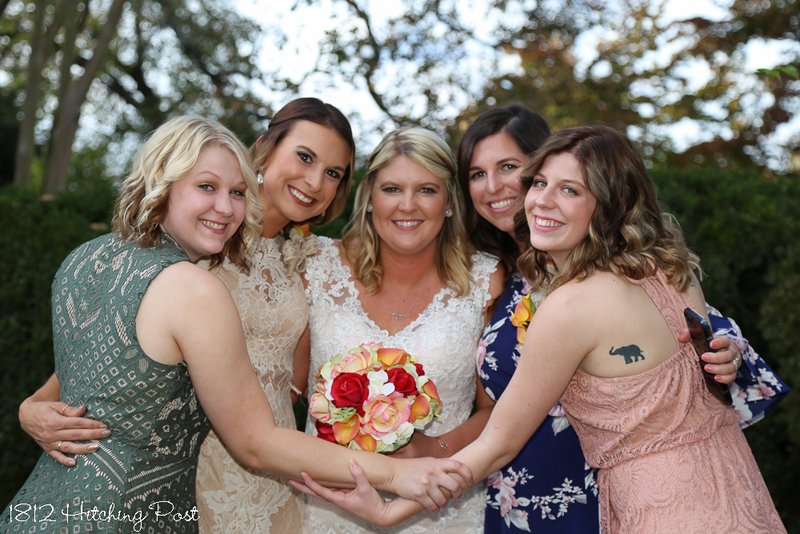 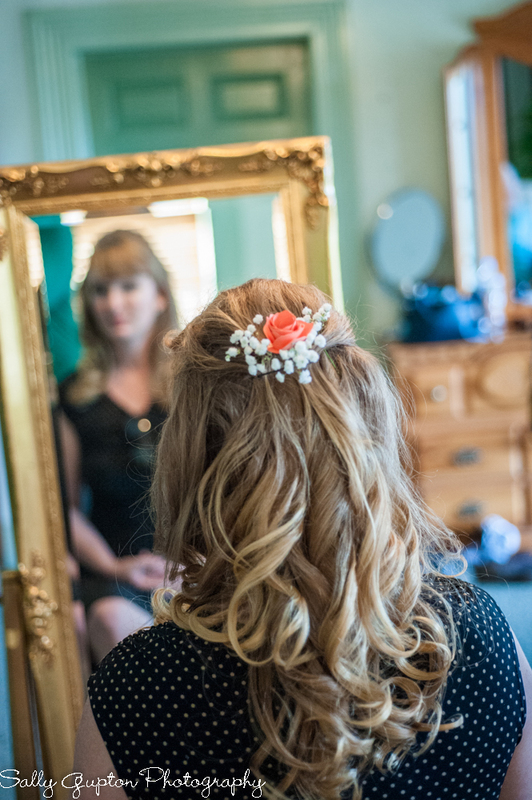 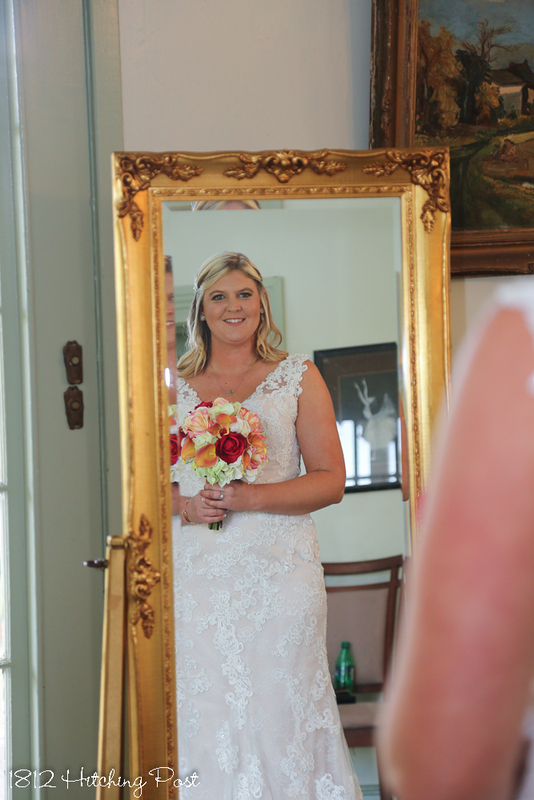 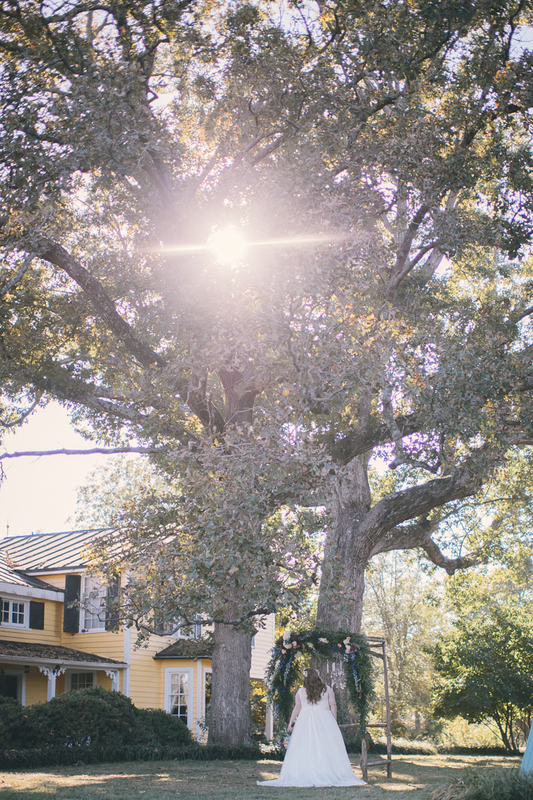 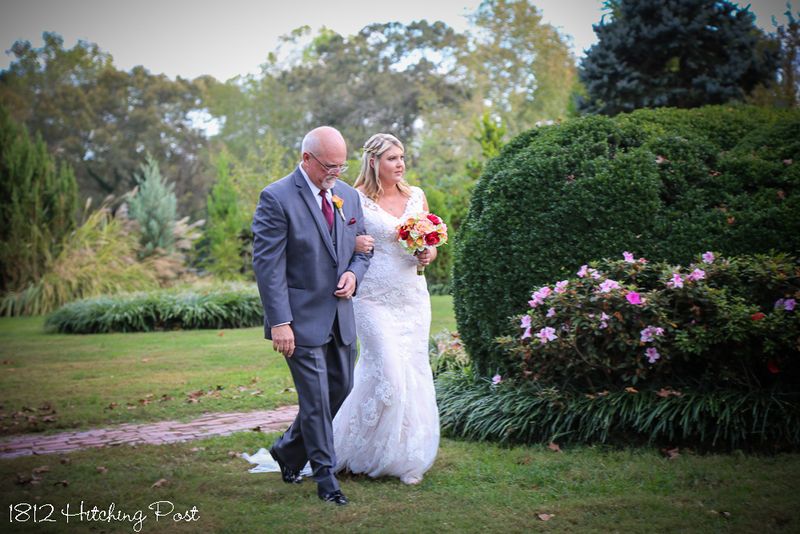 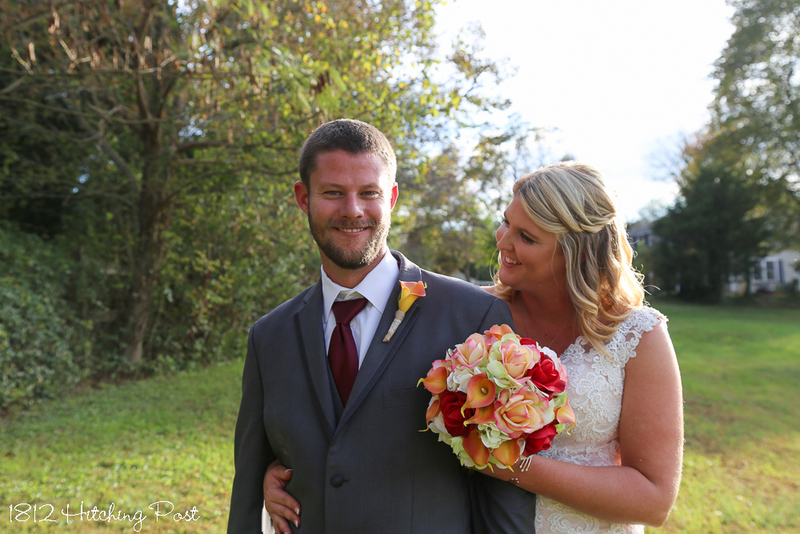 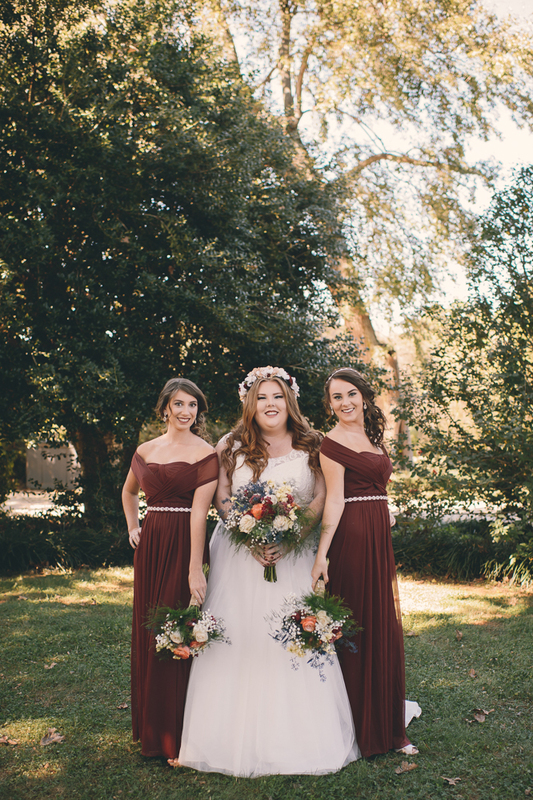 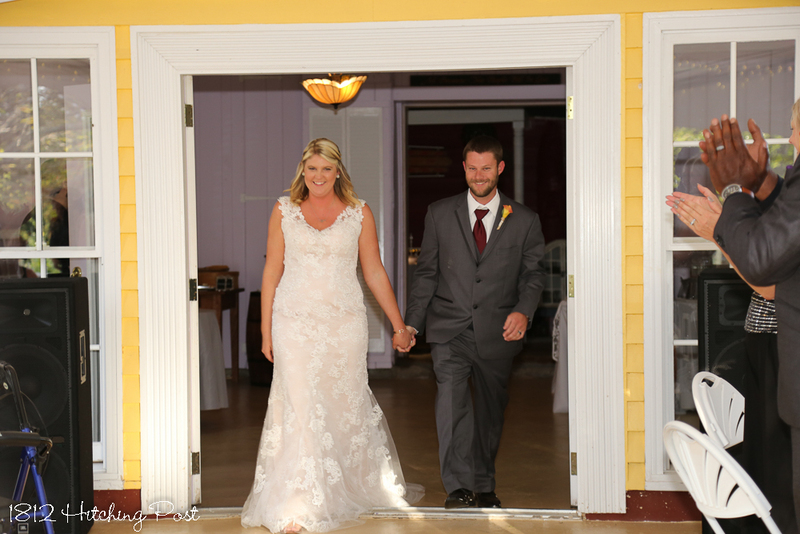 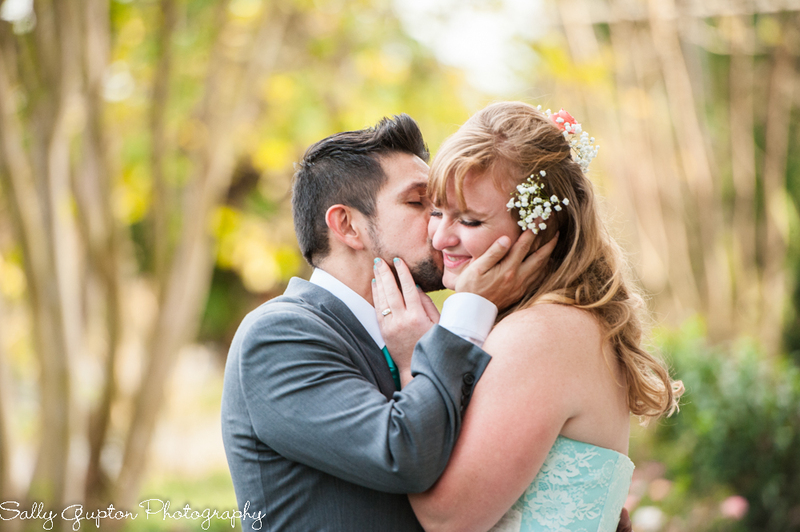 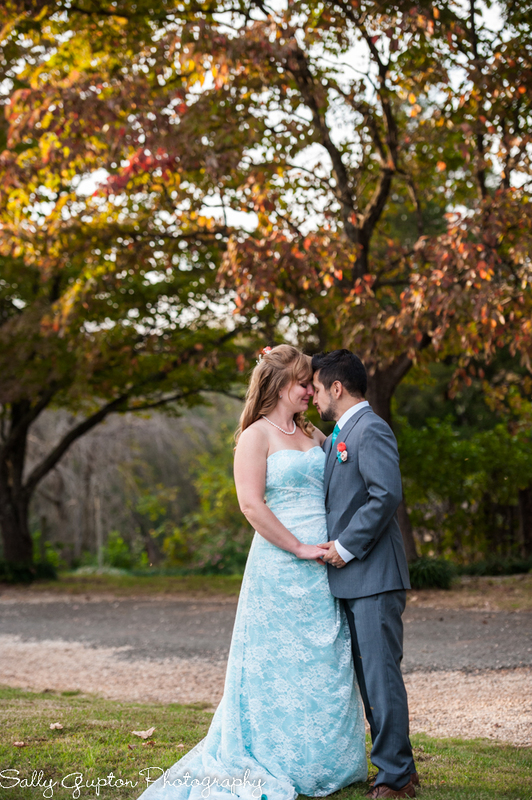 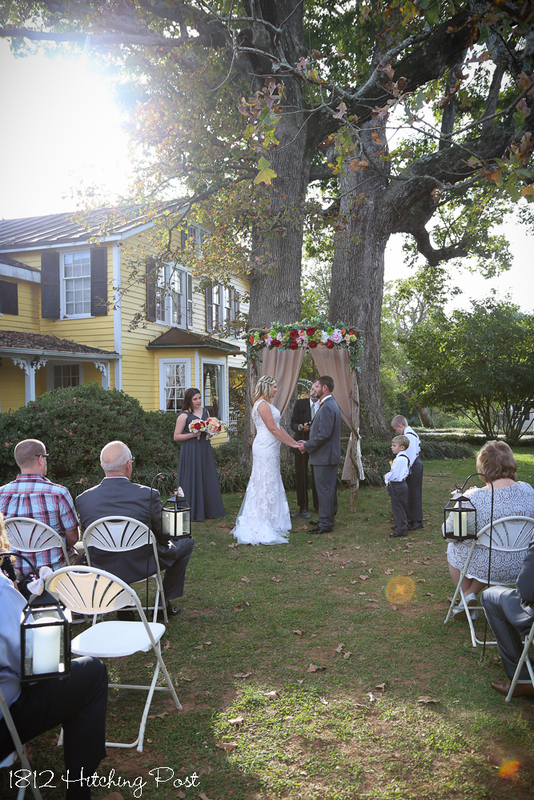 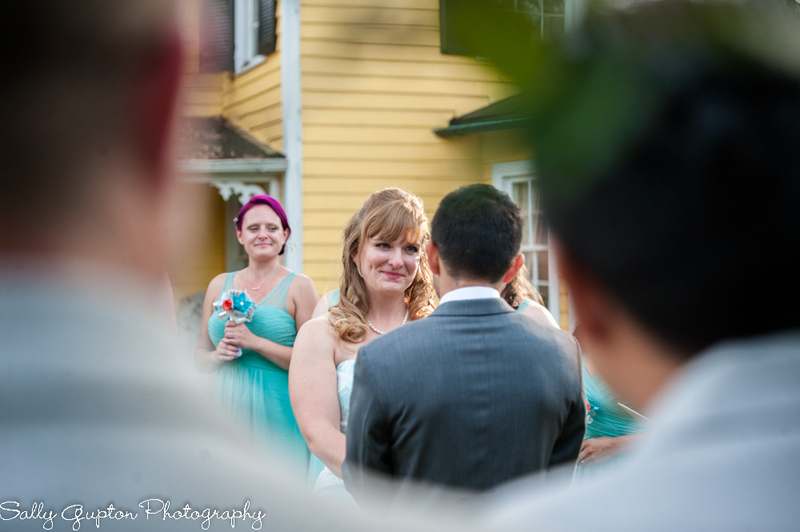 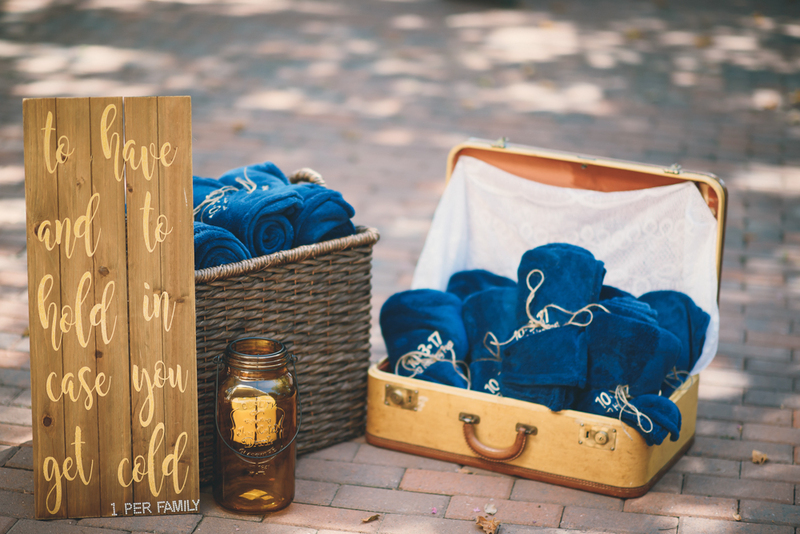 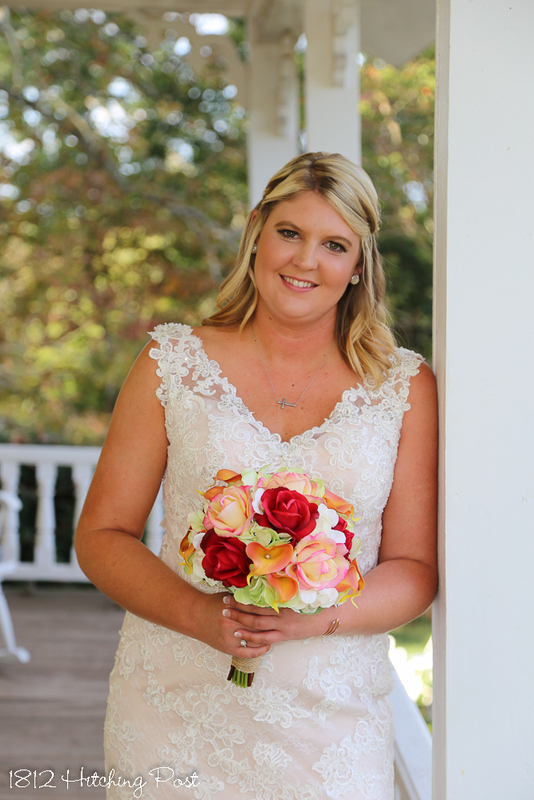 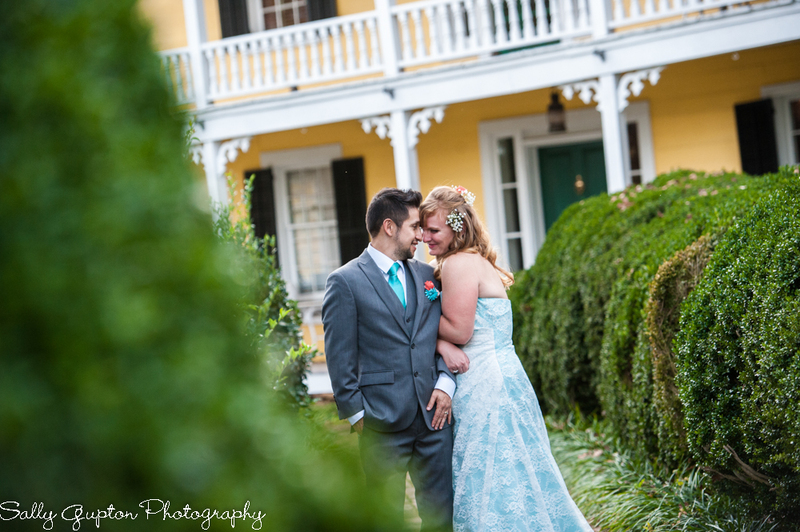 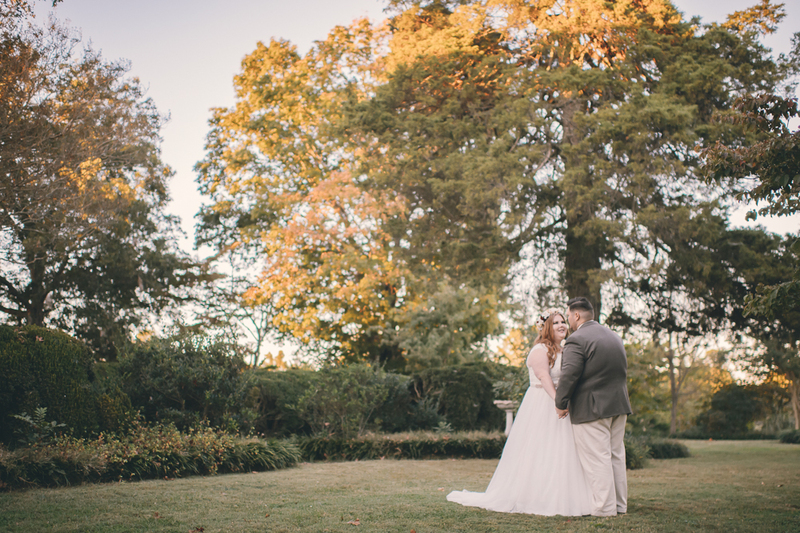 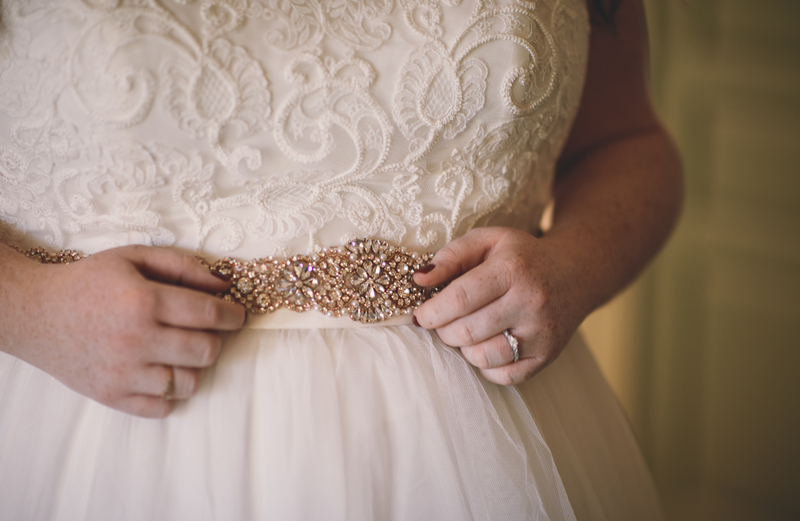 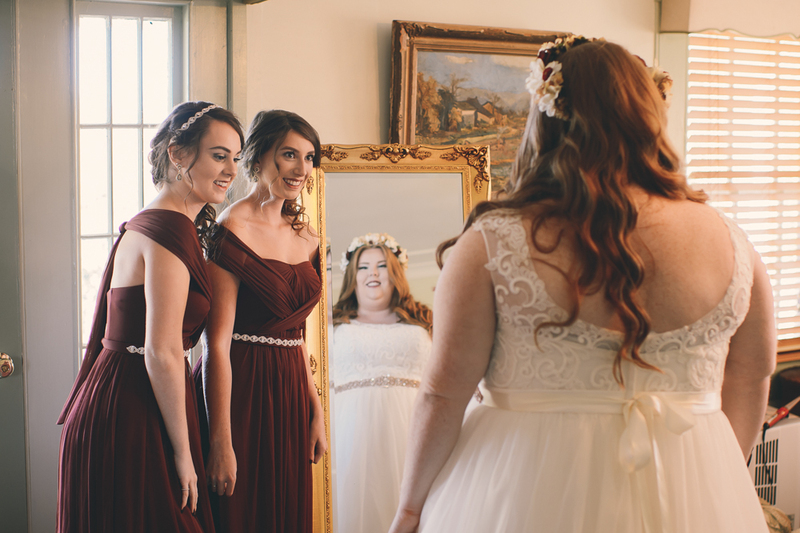 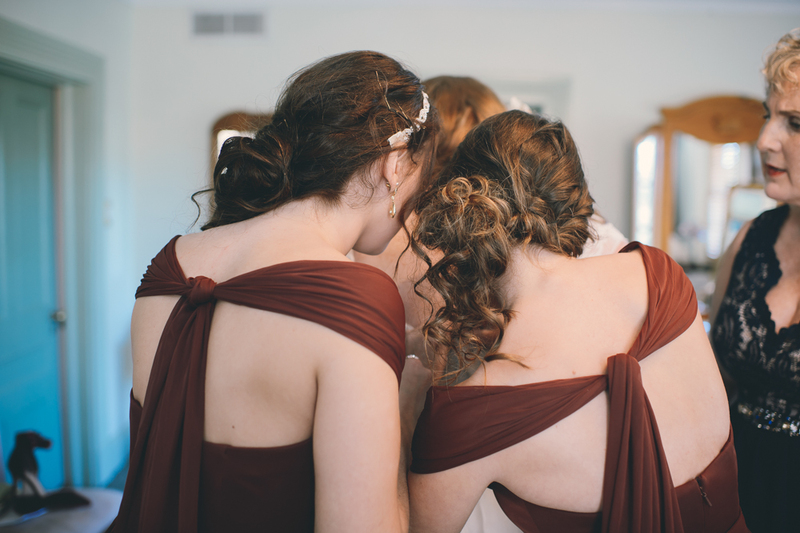 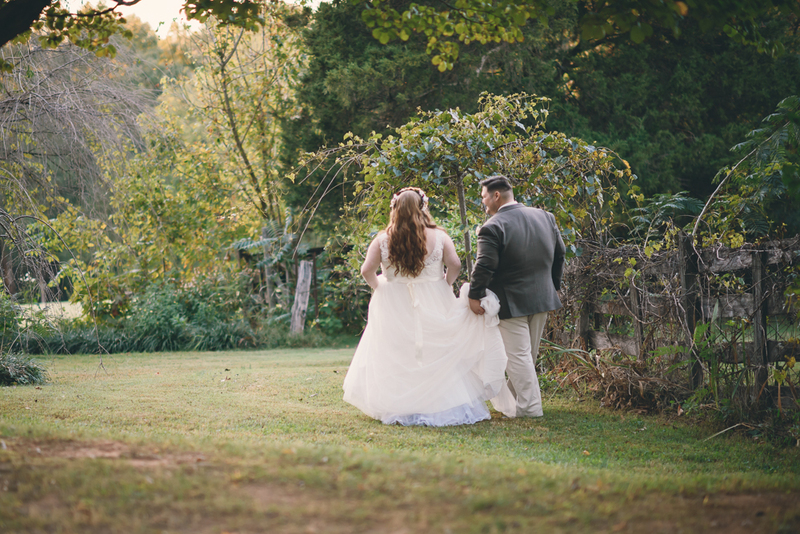 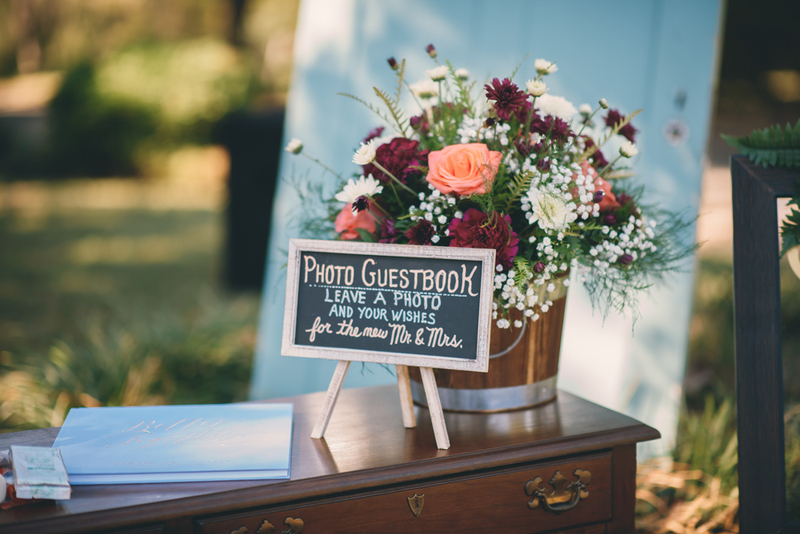 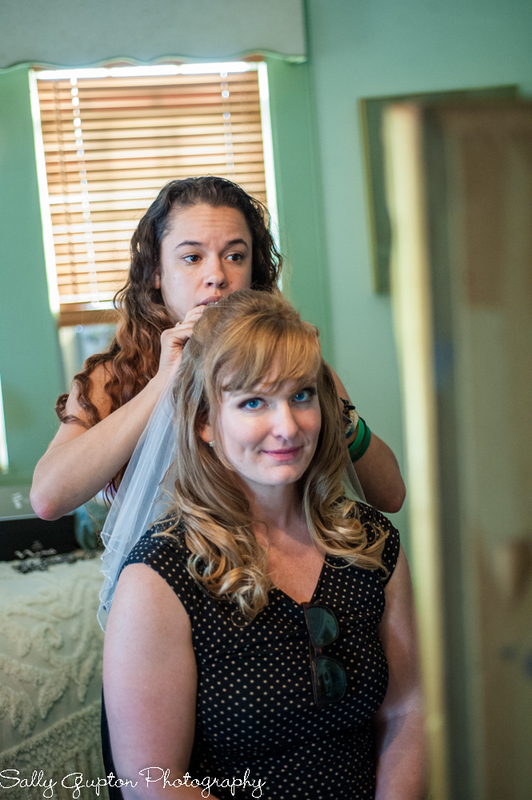 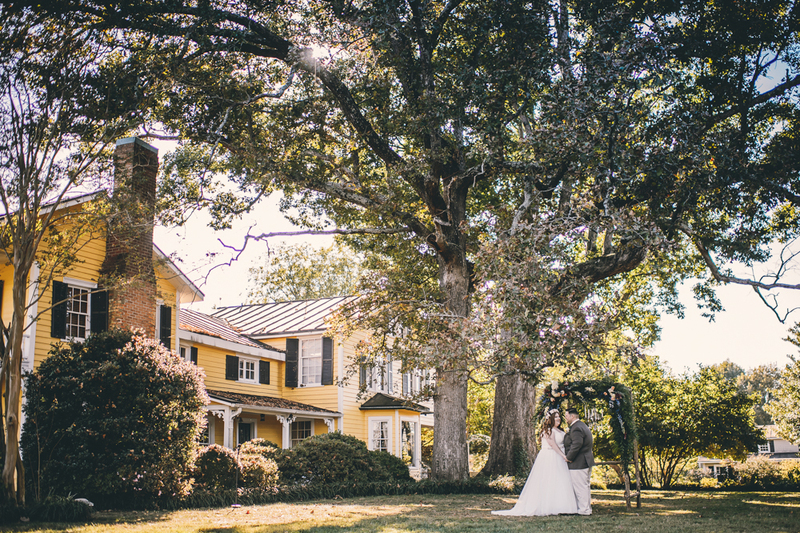 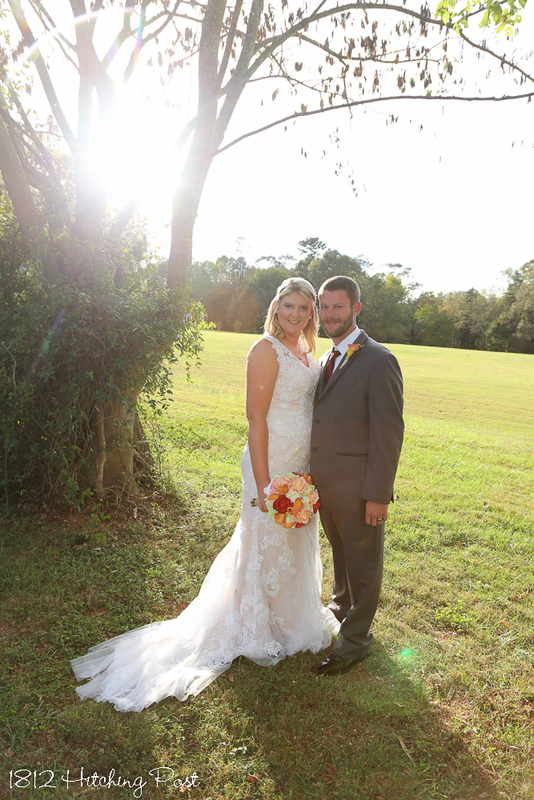 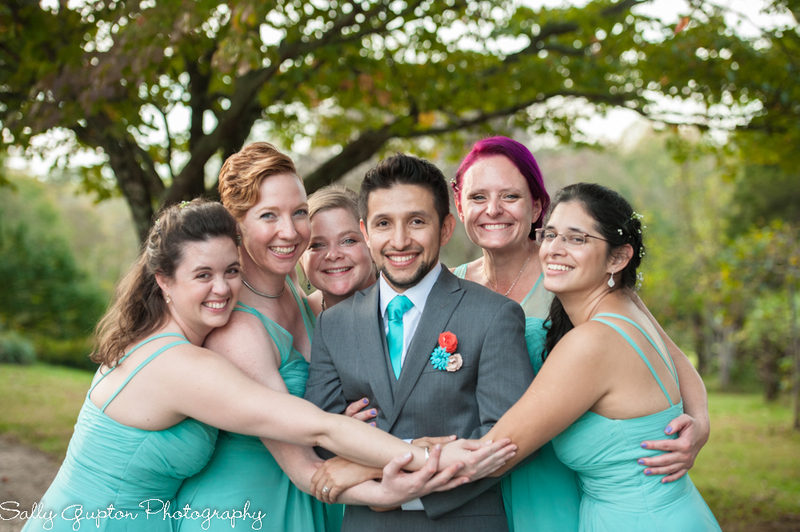 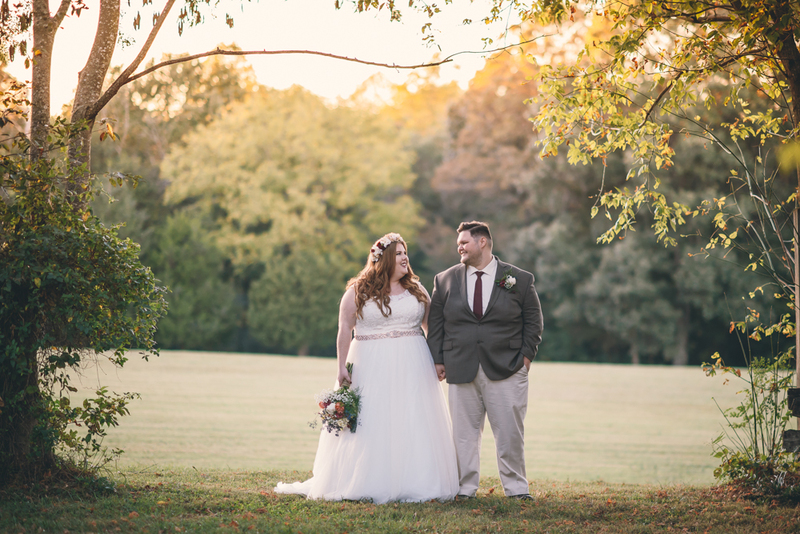 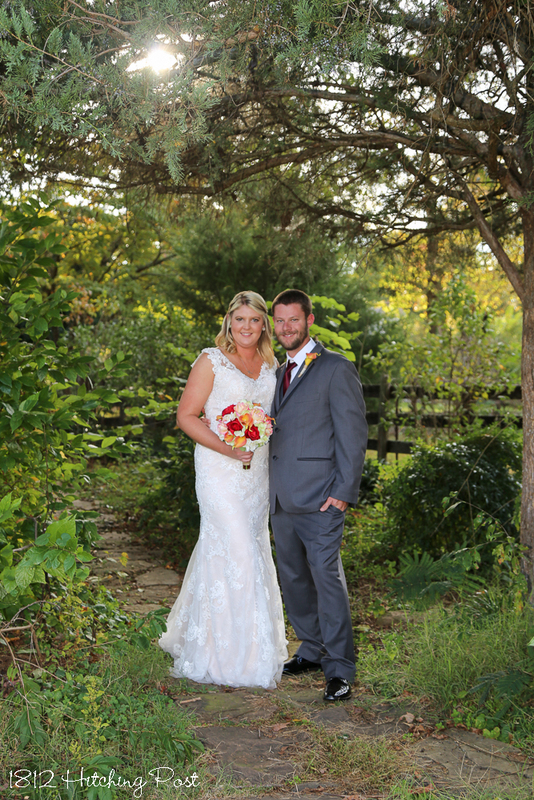 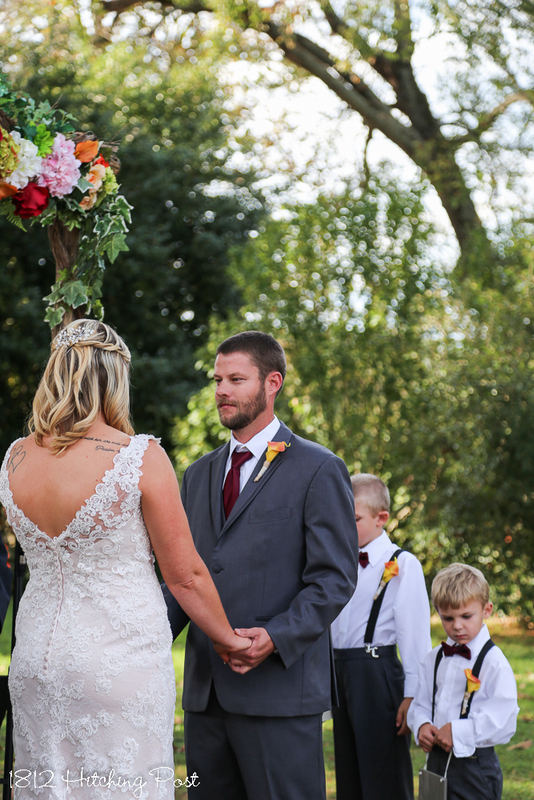 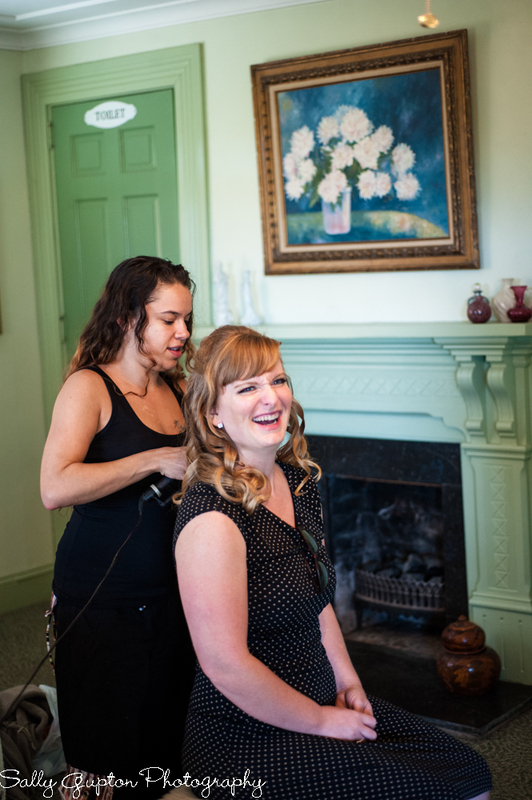 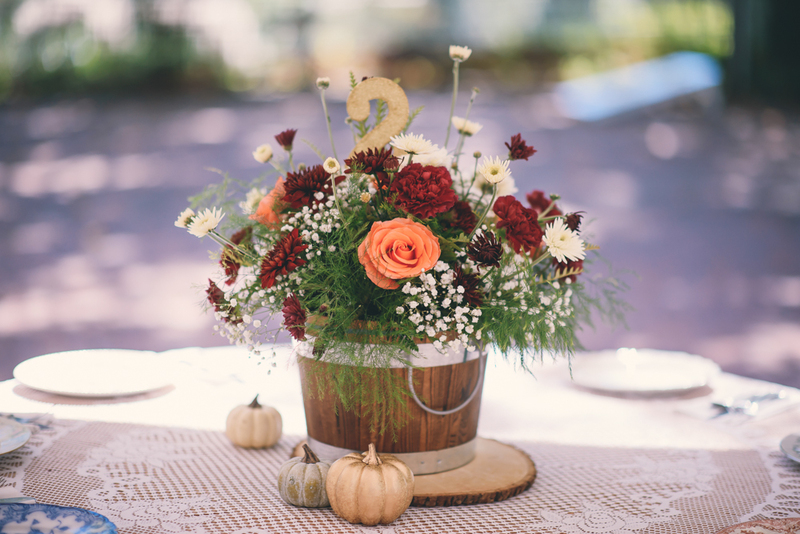 This weekday afternoon October wedding was beautiful with loads of special touches! 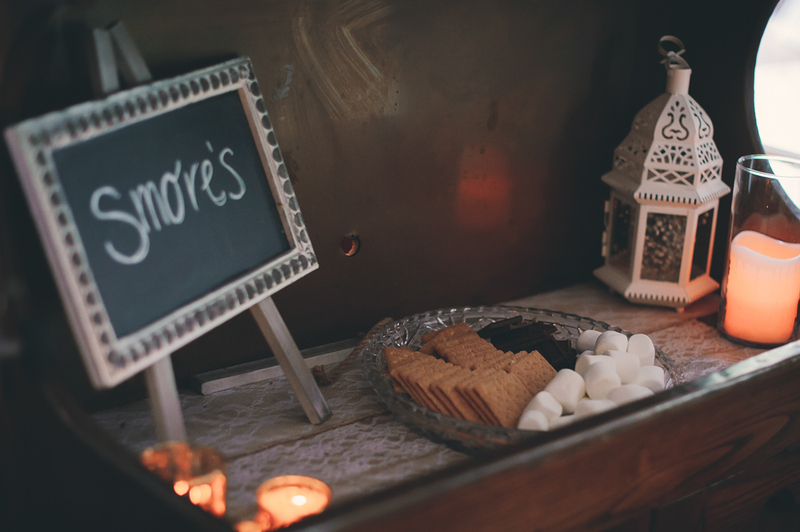 Nothing says October more than S’mores and corn hole by the fire. 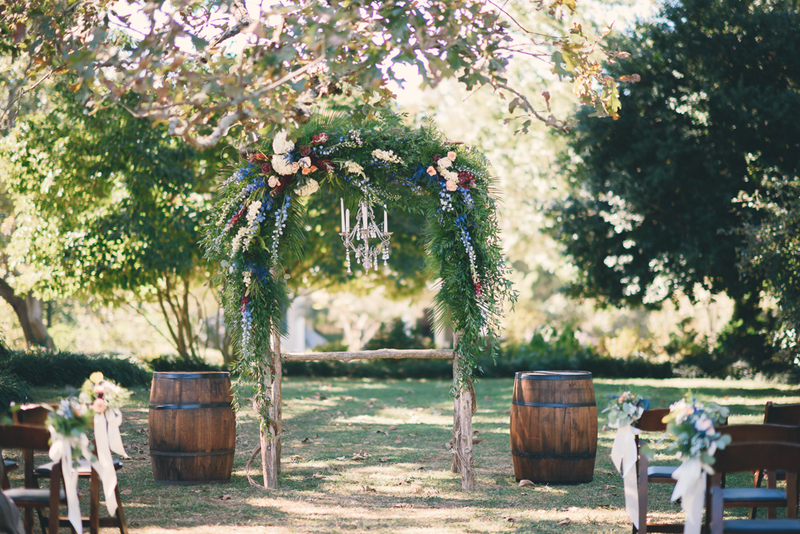 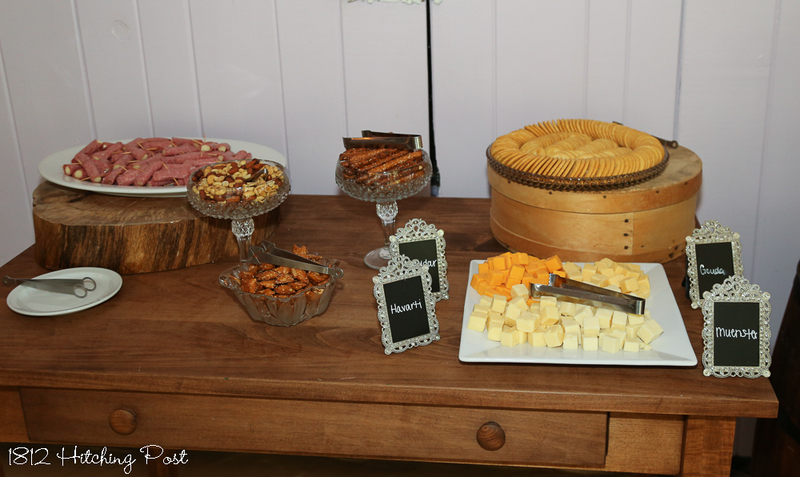 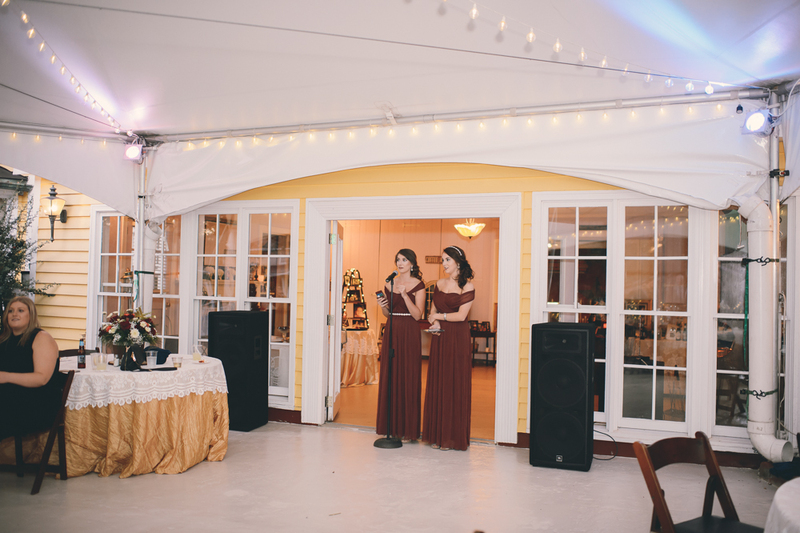 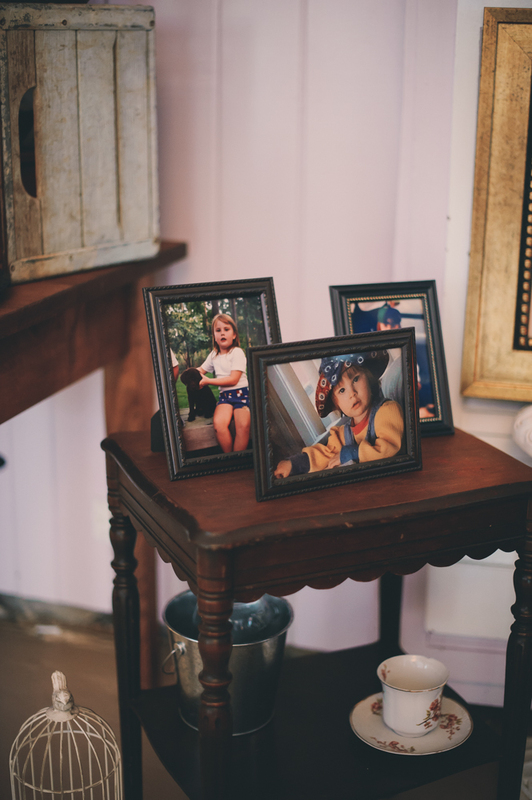 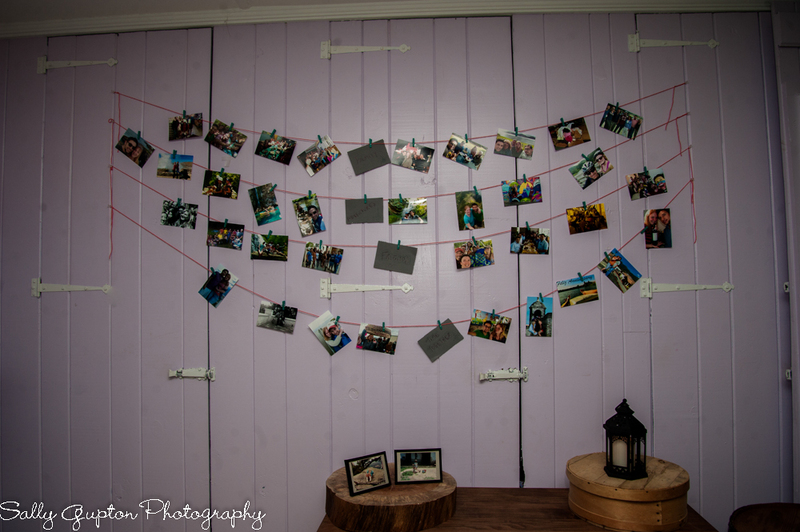 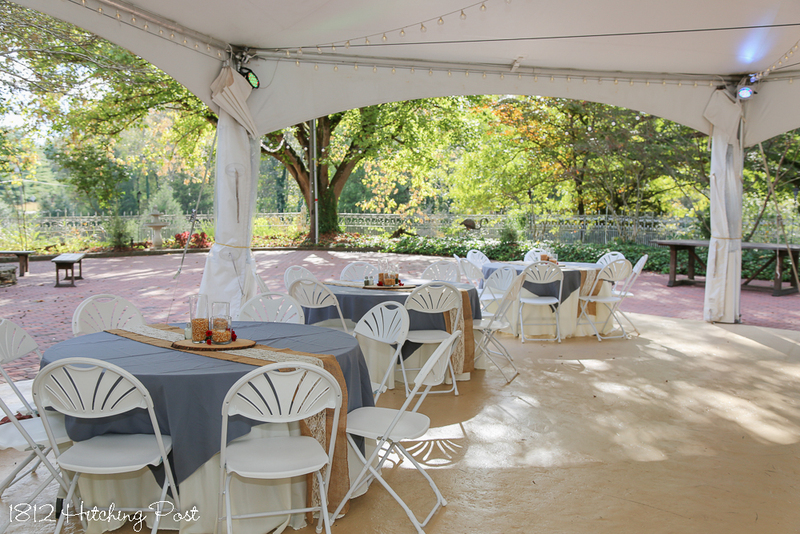 We incorporated a vintage wine country theme throughout. 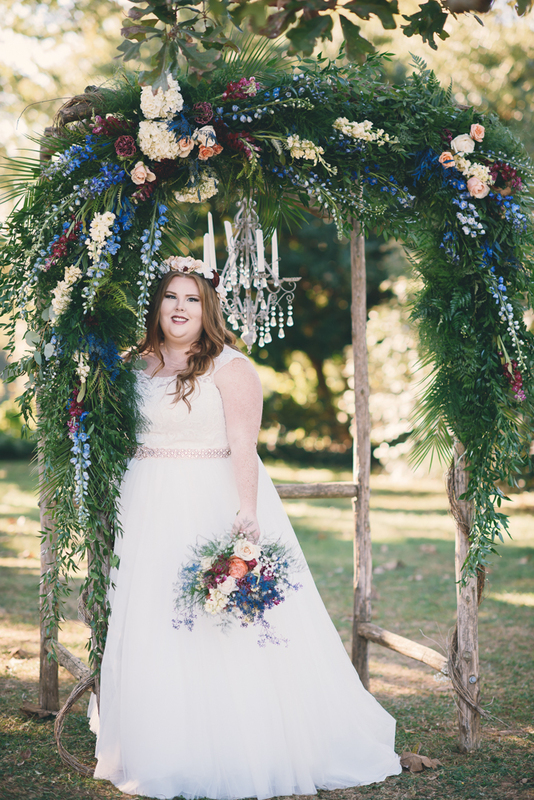 The arbor had gorgeous asparagus fern garlands with fall colors. 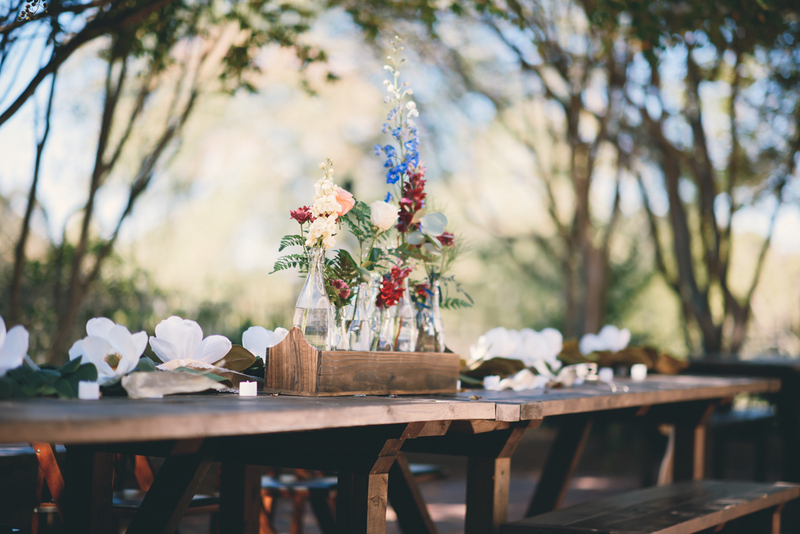 The tables were covered with gold and lace tablecloths and topped with wood wine barrels with flowers. 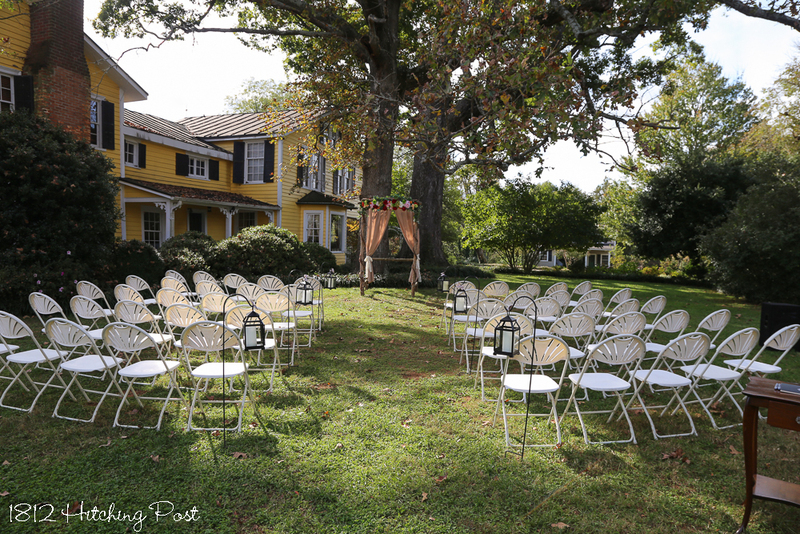 Our barrels were on either side of the arbor and were later moved to the reception to hold the vintage typewriter and photos. 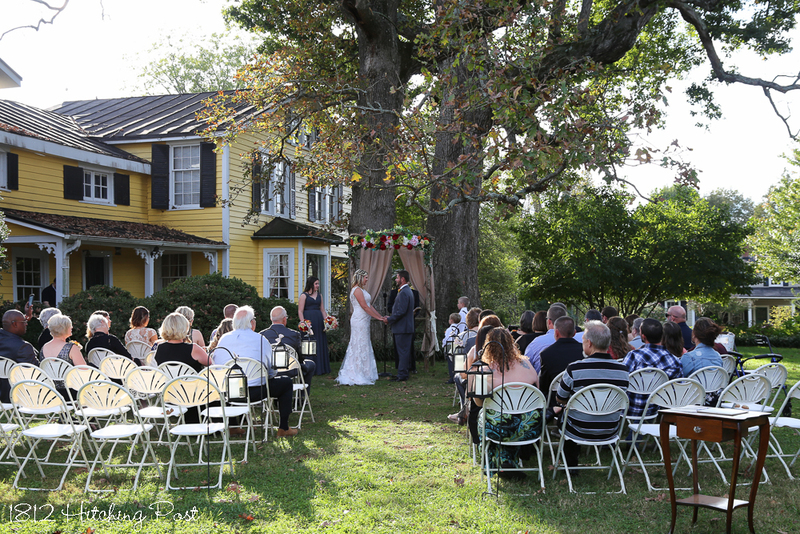 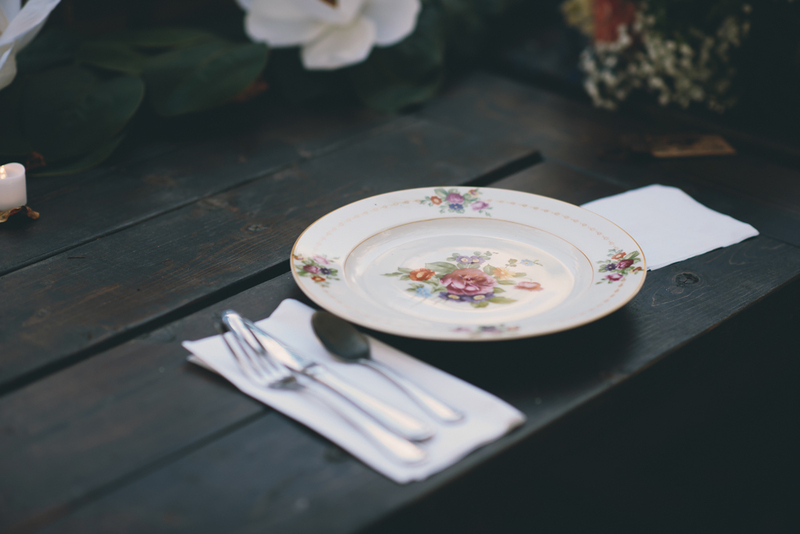 The 1812 Hitching Post provided most of the rustic and vintage decor including the mismatched china and suitcases. 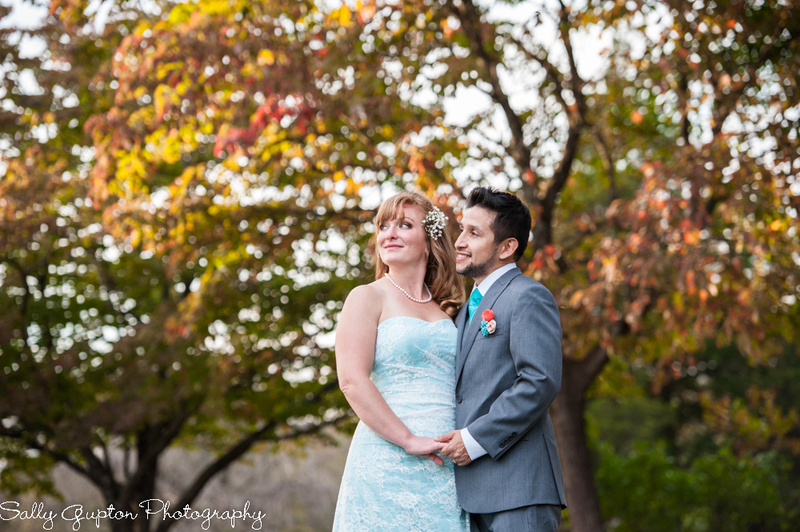 Kristi Marie Photography provided these gorgeous photos.